Amid the excitement of Halloween, the church also is preparing for the Feasts of All Saints and All Souls. At Our Lady of Mt. 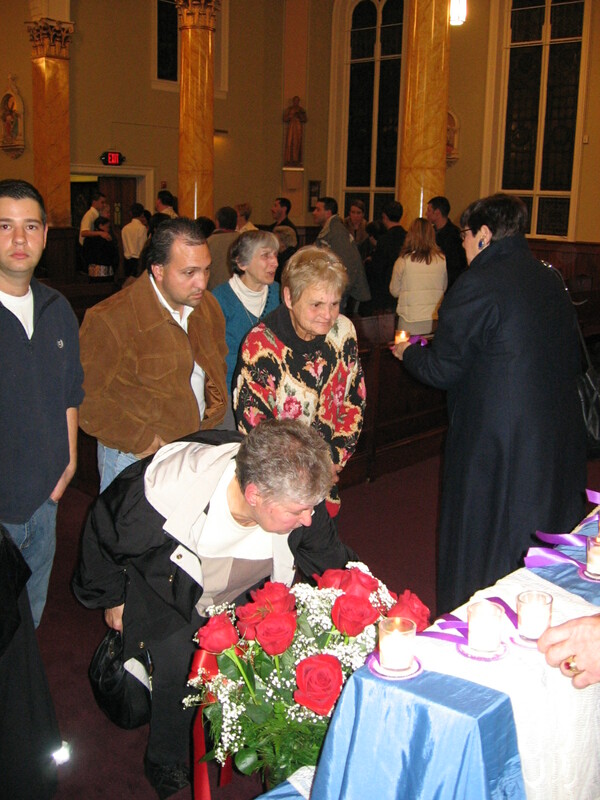 Carmel Parish in Springfield, the Feast of All souls is a special way for families who have lost a loved one in the previous year to come together. 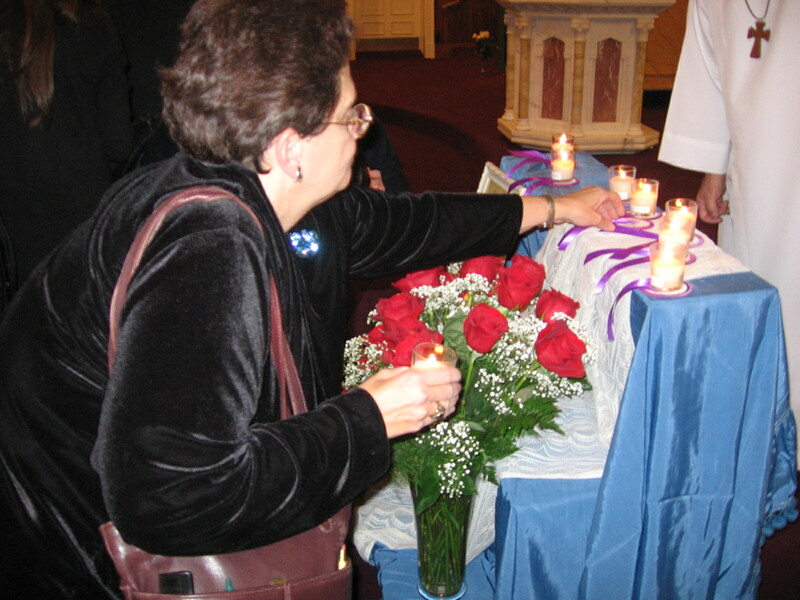 Parishioners and their families are invited to offer a memorial candle at Mass during a litany of names. 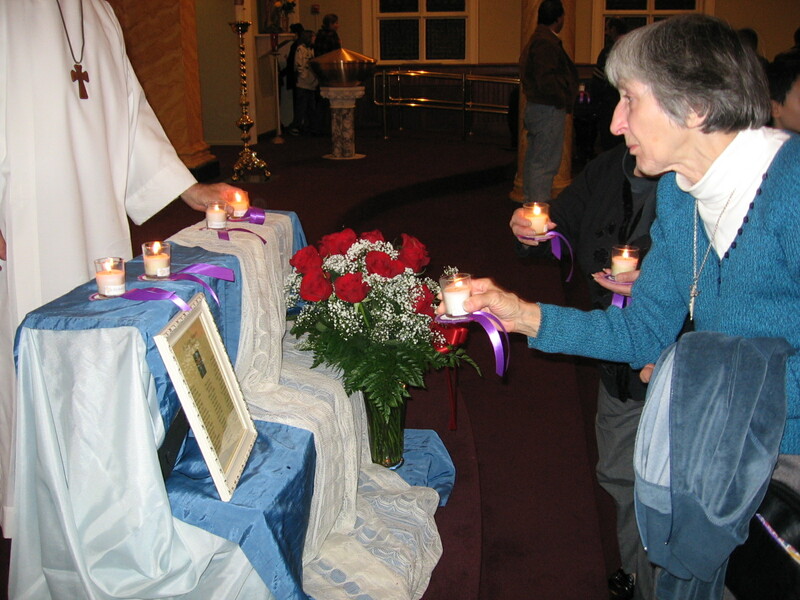 They then bring the candle home for a prayerful rememberance. 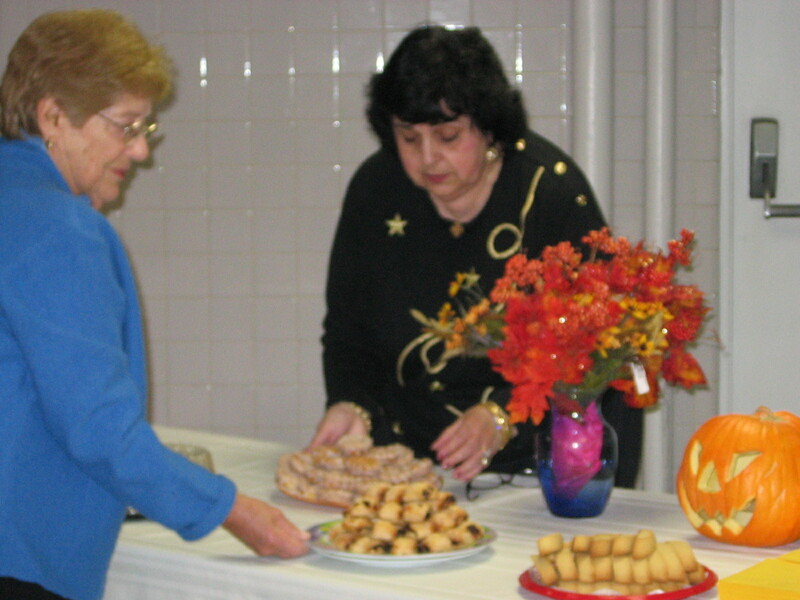 After Mass, the congregation gathers for refreshments and to socialize. The evening is sponsored by the Pastoral Council Spiritual Life Commission. This year’s Mass will be Nov. 3 at 7 p.m. All are welcome. Photos and information courtesy of Sister of St. Joseph Betty Matuszek, pastoral minister at Our Lady of Mt. Carmel Parish in Springfield. 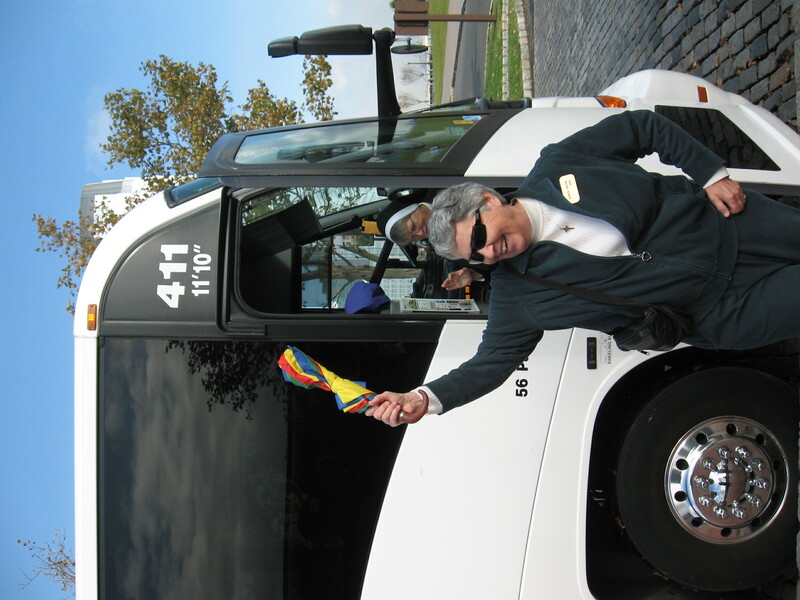 A bus filled with pilgrims from the Diocese of Springfield journeyed to Ellis Island on Oct. 19 to view the “Women & Spirit: Catholic Sisters in America” exhibit. The moving exhibit tells of the contributions of religious communities to life in the United States for almost 300 years. The exhibit continues there until Jan. 22, 2011. It is sponsored by the History Committee of the Leadership Conference of Women Religious. It does a phenomenal job of showing the depth and breadth of the contributions made by women religious. The special web site dedicated to this exhibit offers videos, photos, teachers’ guides and an abundance of information that should not be missed. 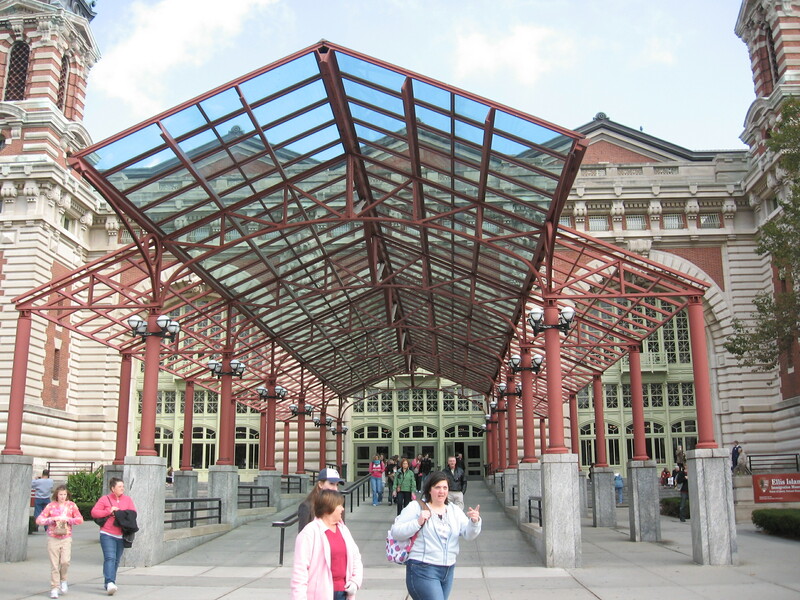 If you cannot make it to Ellis Island before the end of Januray then you must click on this link. And if you have made the journey, it is still worth reading more. 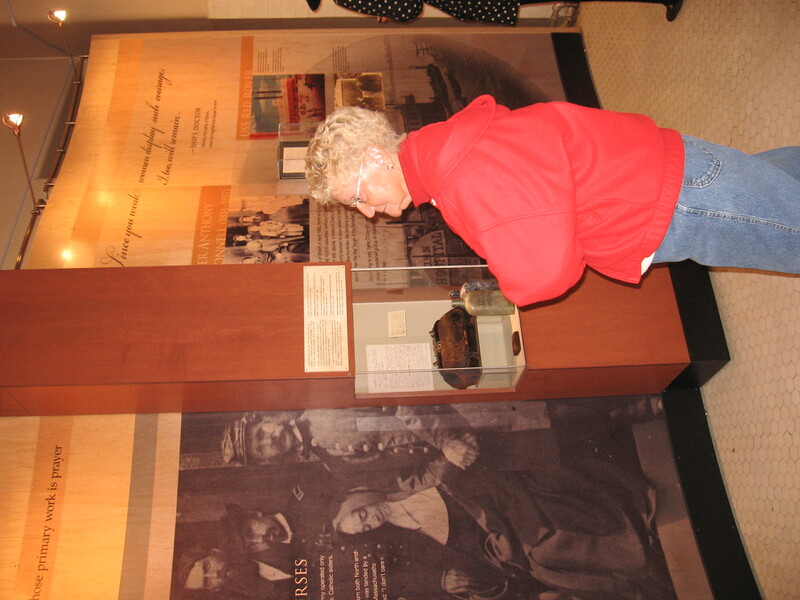 It is hard to take in all of the information presented at the exhibit. The women religious have done so many incredible things. 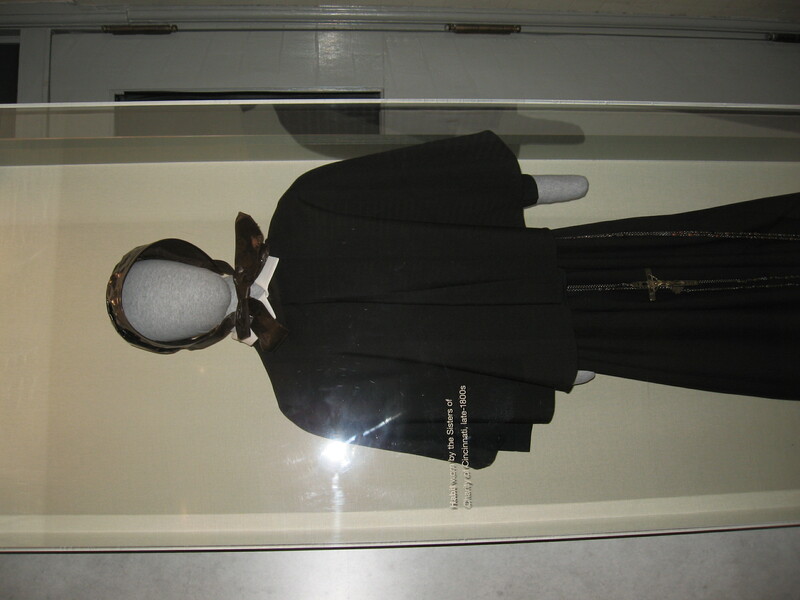 The first medical license given to a woman in New Mexico was Sr. Mary de Sales Leheney. 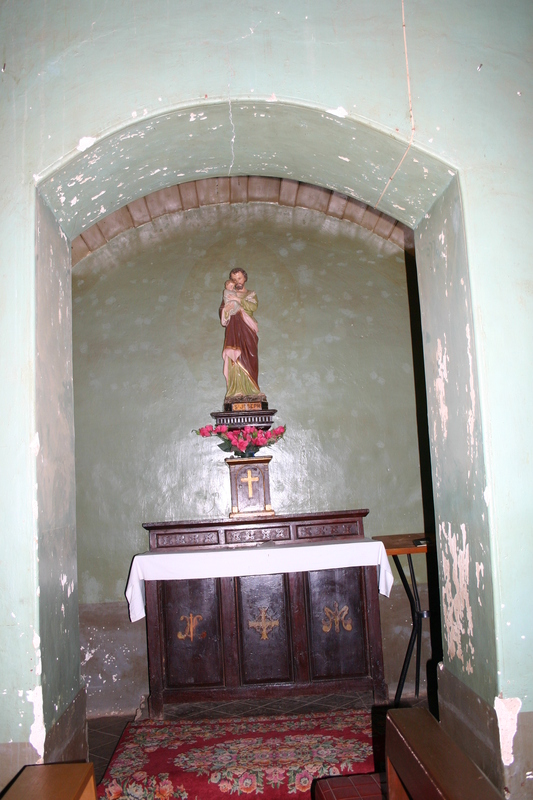 In 2005, approximately one in six hospital patients in the U.S. were treated in a Catholic facility. During the Civil War, the Sisters of the Holy Cross staffed the first U.S. Navy hospital ship, the USS Red Rover. More than 600 sisters from twenty-one different religious communities nursed both Union and Confederate soldiers alike during the Civil War. In the founding days of Alcoholics Anonymous, Sister Ignatia Gavin of the Sisters of Charity of St. Augustine successfully advocated that alcoholism should be treated as a medical condition. 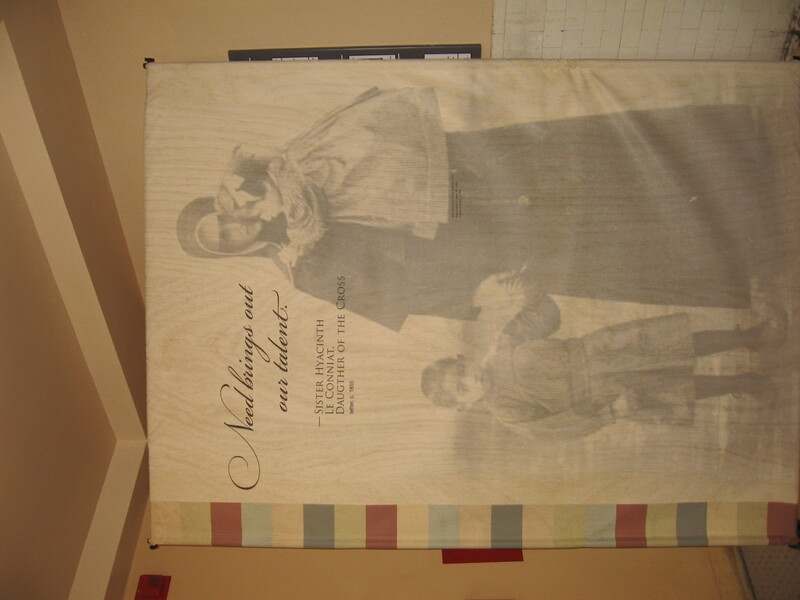 Catholic sisters established the nation’s largest private school system, educating millions of young Americans. 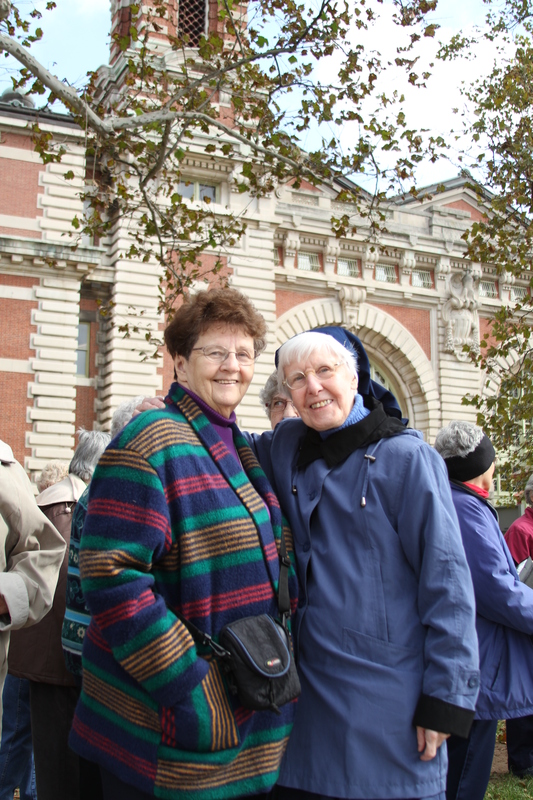 More than 110 U.S. colleges and universities were founded by Catholic sisters. Since 1980, at least nine American sisters have been martyred while working for social justice and human rights overseas. Sister of St. Joseph Judith O’Connell, vicar for religous for the Diocese of Springfield, organized the Oct. 19th pilgrimage. 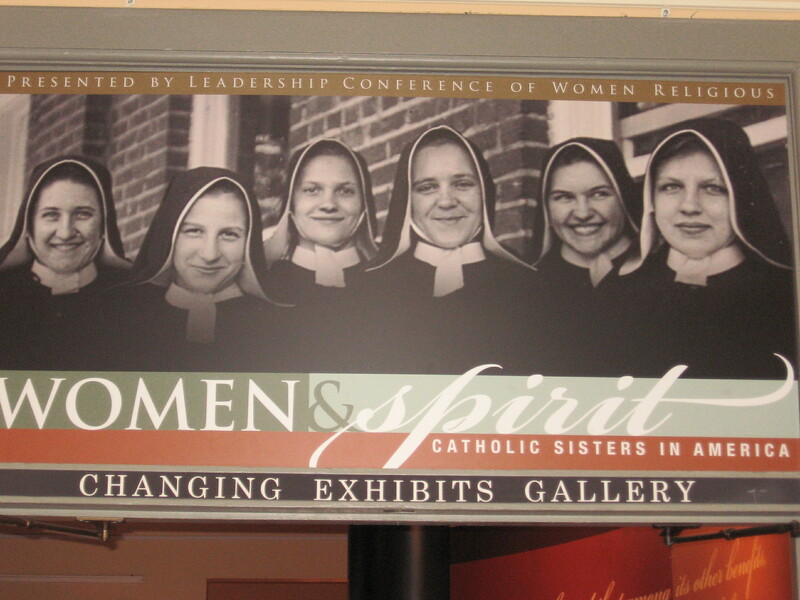 She noted that the Sisters of St. Joseph (SSJ) also were sending two bus loads of sisters, associates and friends on Oct. 30 to meet with other Sisters of St. Joseph to see the exhibit. 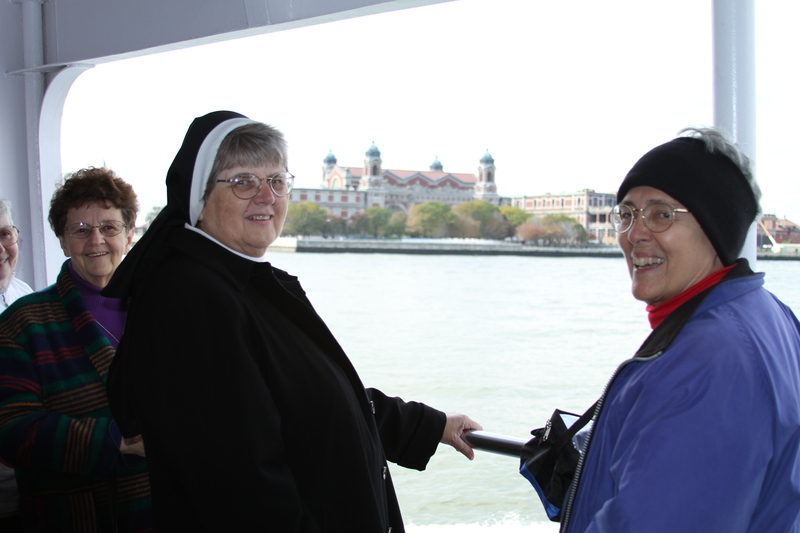 The Oct. 19th pilgrims represented members, friends and associates of the Sisters of Providence, Felician Sisters, Sisters of Notre Dame de Namur, Franciscan Sisters of St. Joseph and the SSJs. From left,. Mindi Rambo, assistant public affairs officer for the National Parks Service, and Bill Pacocha, chief videographer for Catholic Communications prepare for our coverage of the day. 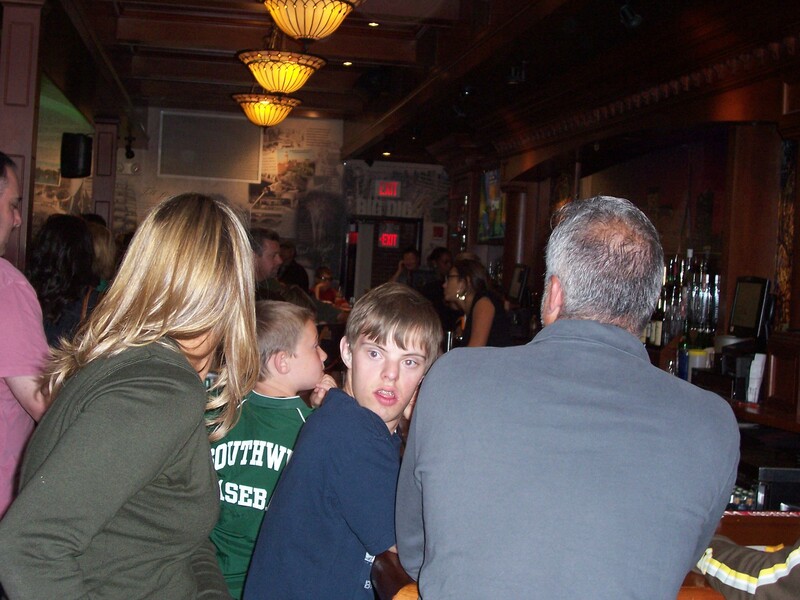 A feature on this trip will air on Real to Reel on WWLP-TV 22 at 7 p.m. on Dec. 4th. 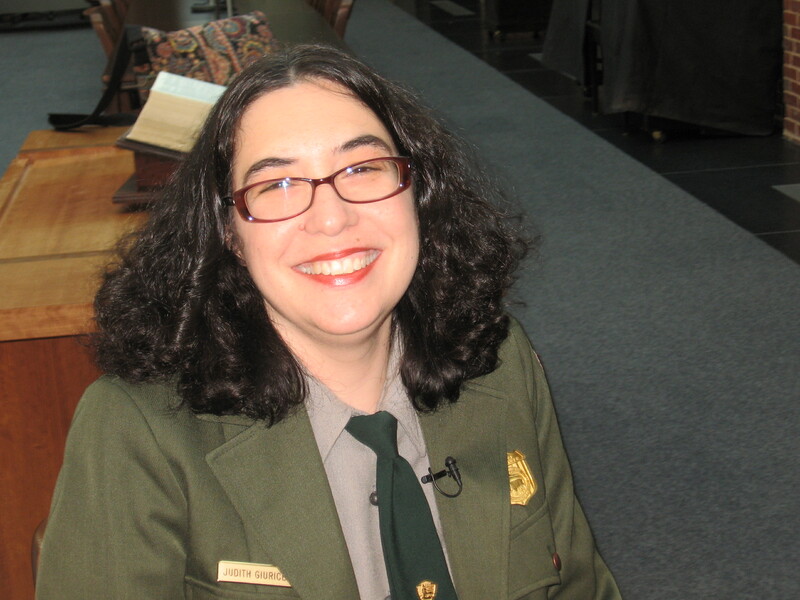 Judy Giuriceo-Lord will be featured on the show. Her husband's family is from Springfield. 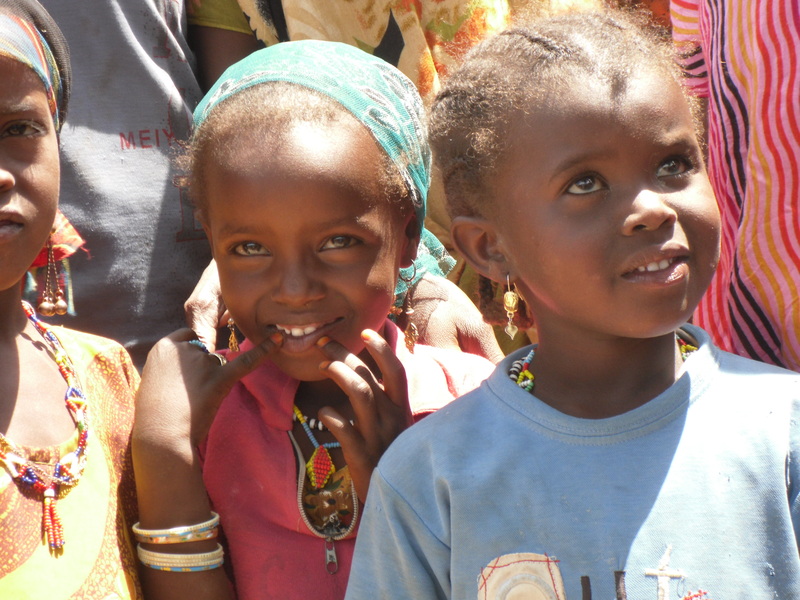 This once-in-a-lifetime experience to Africa was sponsored by Catholic Relief Services. 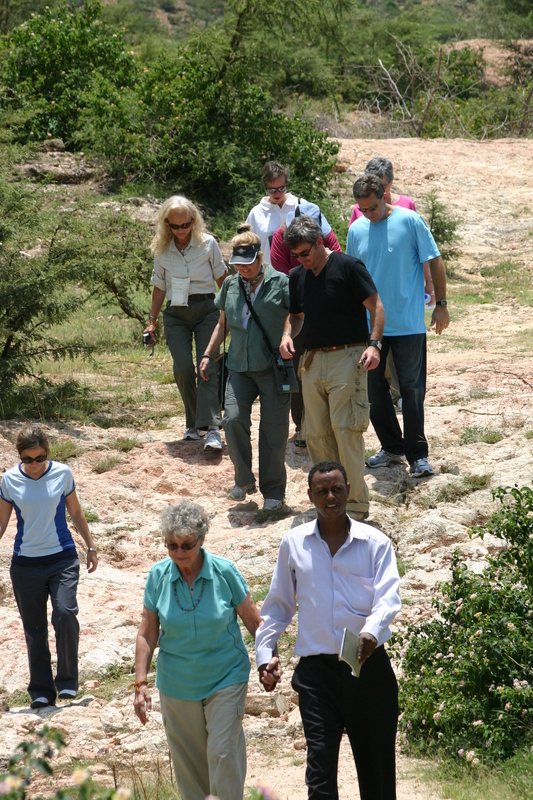 Twelve Diocesan directors from across the U.S. were chosen to visit CRS’s development work in Ethiopia and Tanzania. 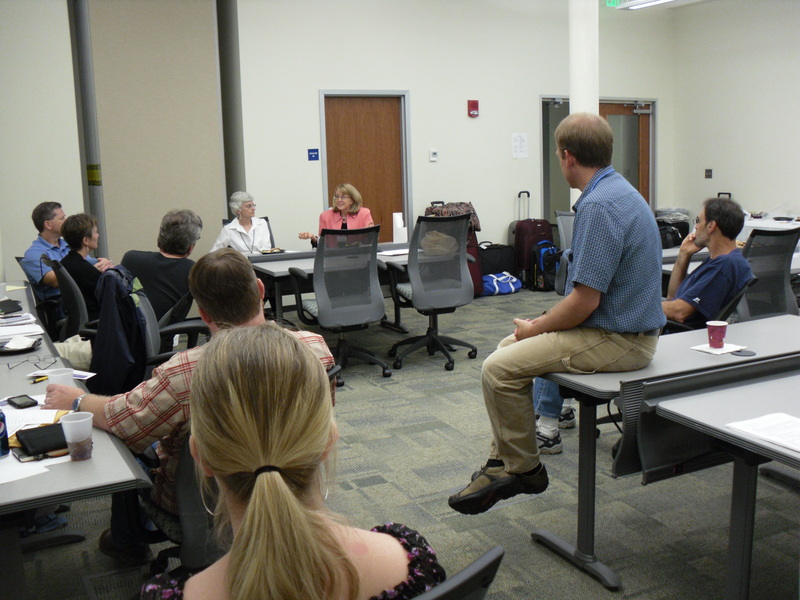 Our trip began at the Baltimore headquarters for Catholic Relief Services where we received our pre-trip briefing. 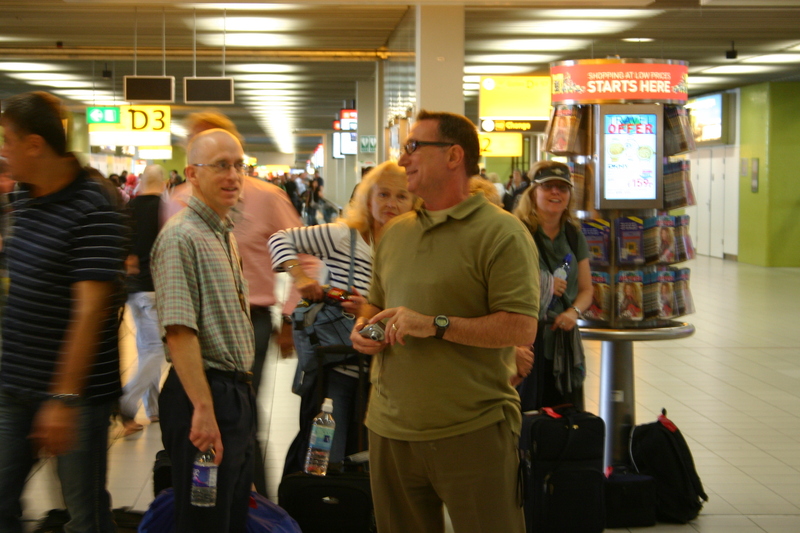 We took off from Dulles International and after a 24 hour plus airplane trip (via Amsterdam), we arrived in Ethiopia on September 11, 2010. We spent the night and first day in the capital city, Addis Ababa, which is some 8,000 feet above sea-level. Addis is the largest city in Ethiopia with a population of 5 million. 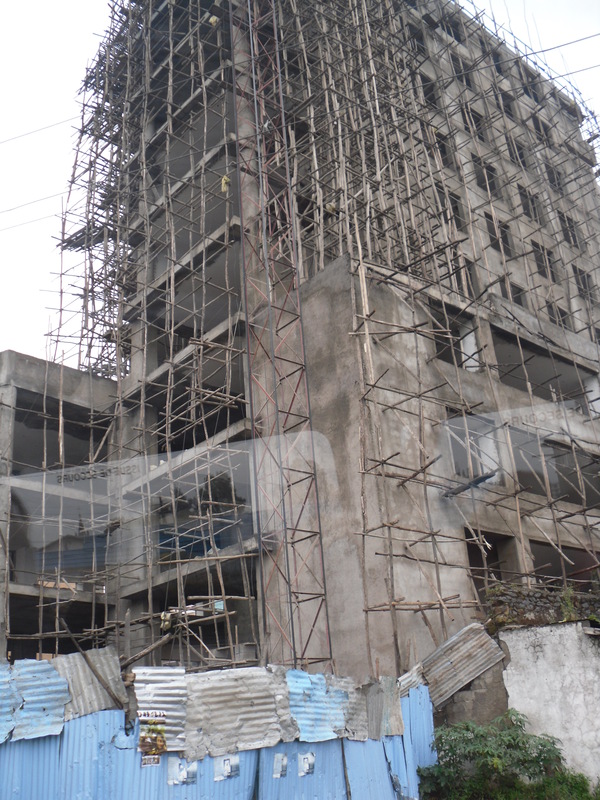 Like so many large cities in the developing world, Addis is a city of stark contradictions. 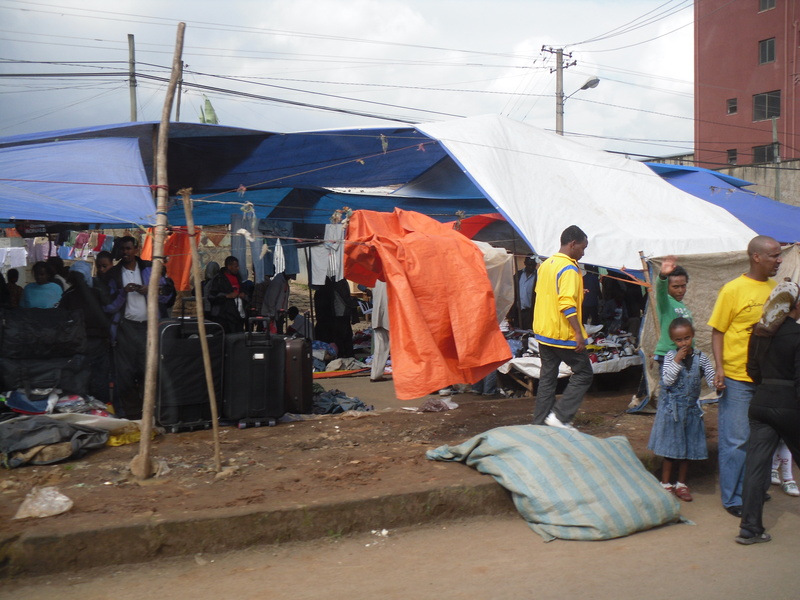 Tall modern buildings, western-style restaurants, clubs and billboards are surrounded by shacks of wood board scraps, corrugated metal and cloth, crammed into the spaces around and between, that serve as both home and storefront for thousands of Addis residents. There are toilets in Ethiopia (of varying styles from holes in the floor to western style), but not all flush. Some of the pipes cannot handle toilet paper, so those toilets have open buckets next to them, into which you throw your used toilet paper. Some toilets have large barrels of water next to them with a large cup to scoop and pour the water into the toilet to wash away your business. Many are simple holes in the floor/ground with no water nor toilet paper. A challenge, somewhat. A surprise, always! “Toilet” talk became a, larger than normal, part of our daily conversation. More on this later….. Briefing for the journey. Catholic Relief Services Headquarters in Baltimore, MD. The adventure begins out of Dulles Airport. Map of Ethiopia. Located on the horn of Africa (Eastern section of Africa). 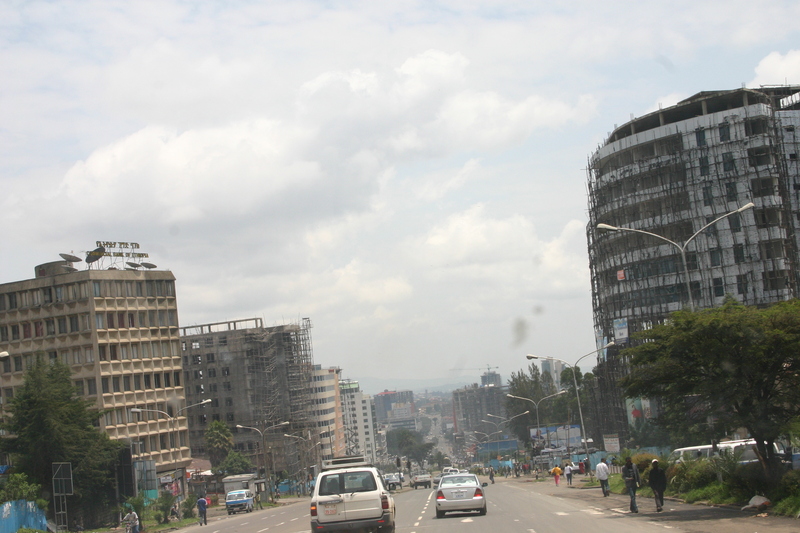 Addis Ababa is the capital and is located in the mountainous middle of the country. 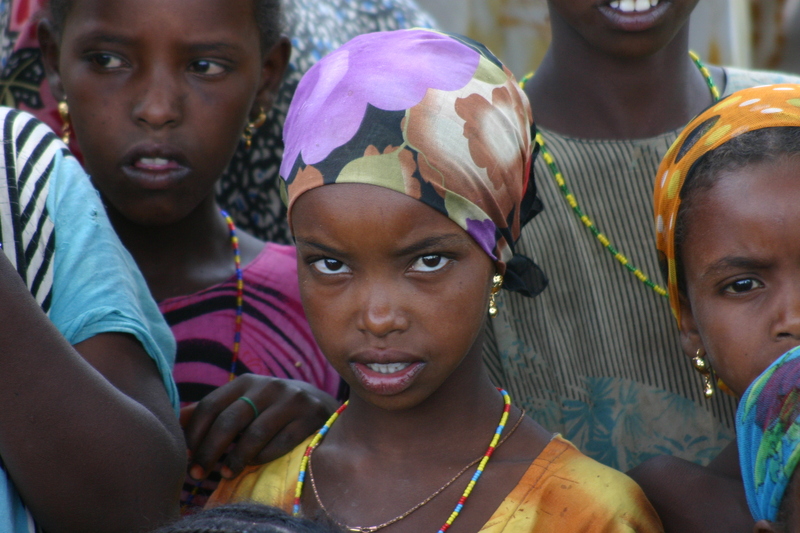 Dire Dawa is located in the Eastern part of Ethiopia -- near Djibouti and Somalia. 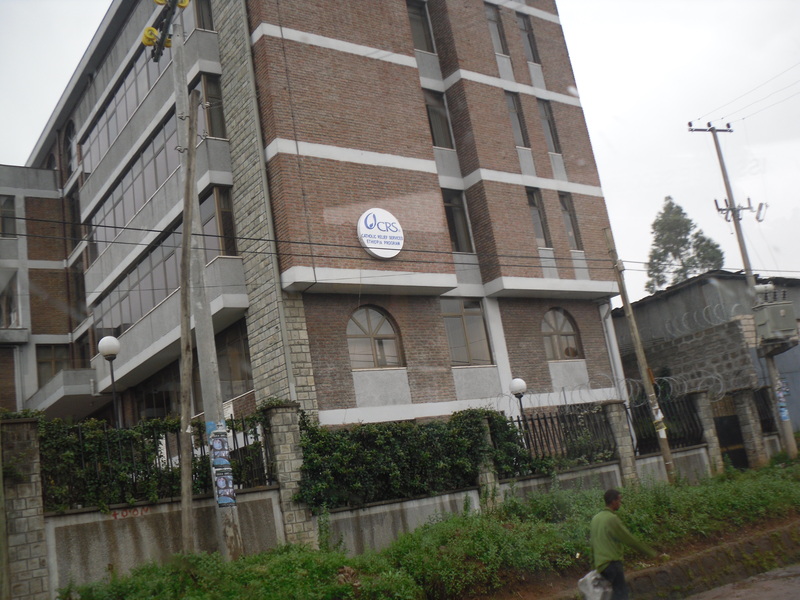 The Catholic Relief Services compound in Addis. Our first night's accommodations. 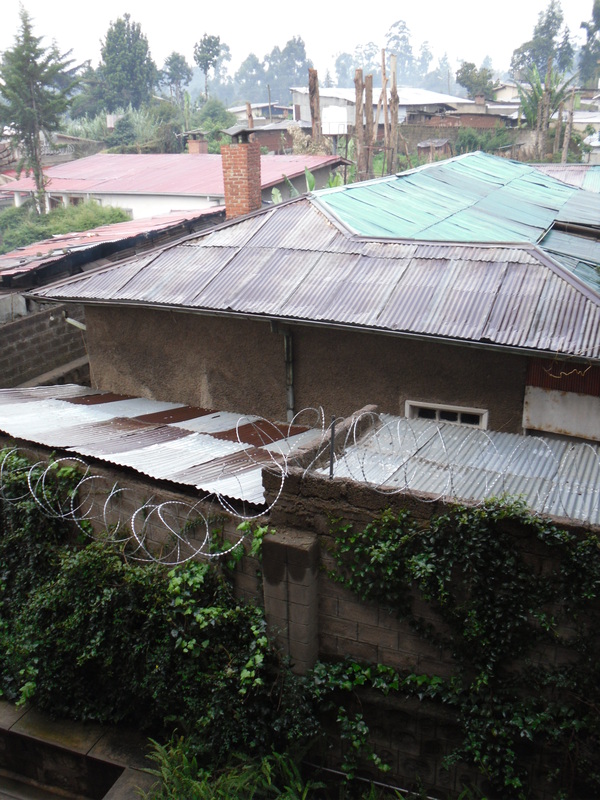 In Addis, not unlike other cities where modernity and poverty exist side-by-side, razor wire is imbedded on the tops of compound walls. First morning in Addis at CRS Headquarters. A hearty breakfast and we are on our way. Sticks and Stones -- the scaffolding of buildings is literally made of large sticks laced together. 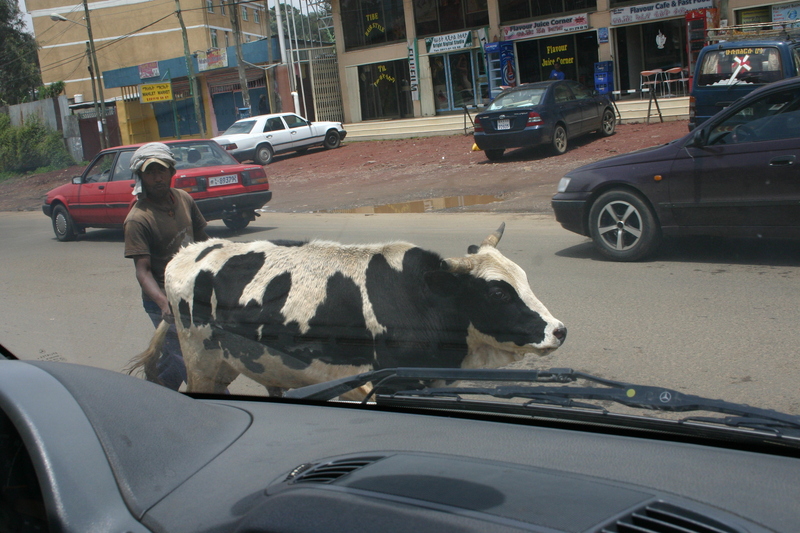 Street scene and an occasional cow!! 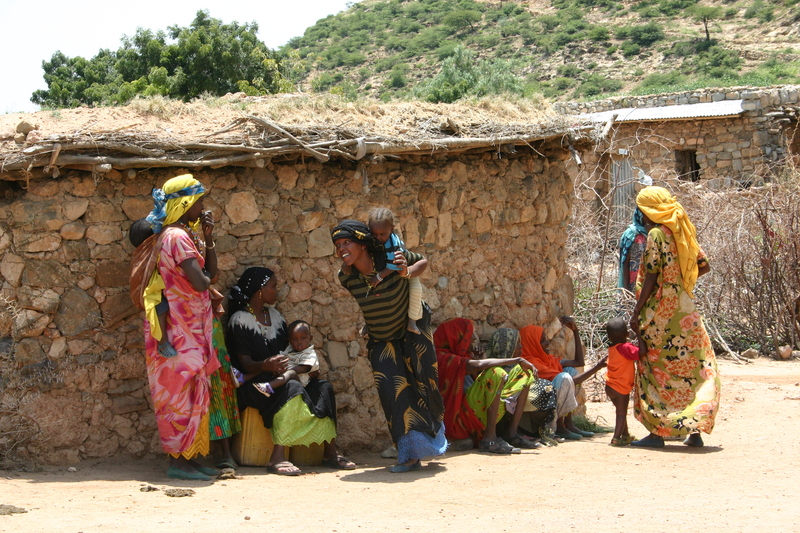 Ethiopia is an ancient land with its own unique language, Amharic and its own unique calendar. Though, for business purposes, Ethiopians observe the more universal calendar, their own calendar has 13 months and their New Year’s Day is September 11 — the day we arrived. It was both a surprise to us and felt strange given our own memories of September 11. 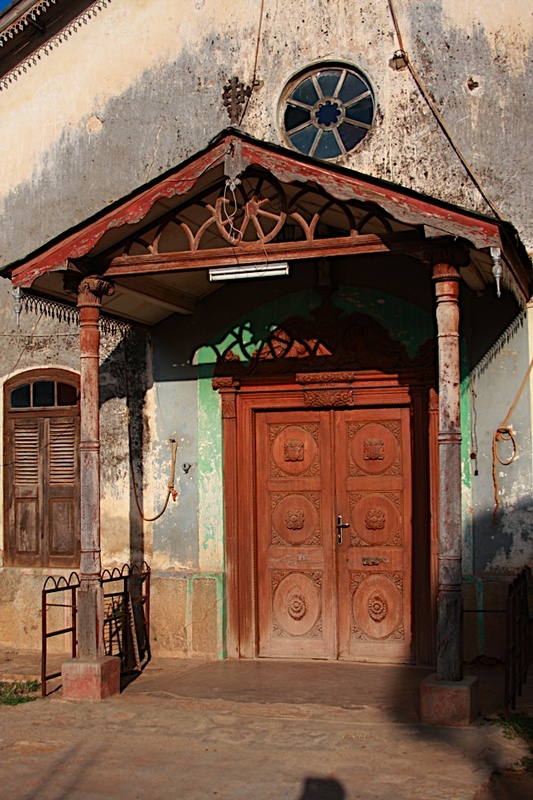 The Ethiopian Catholic Church is among the oldest of Christian churches. 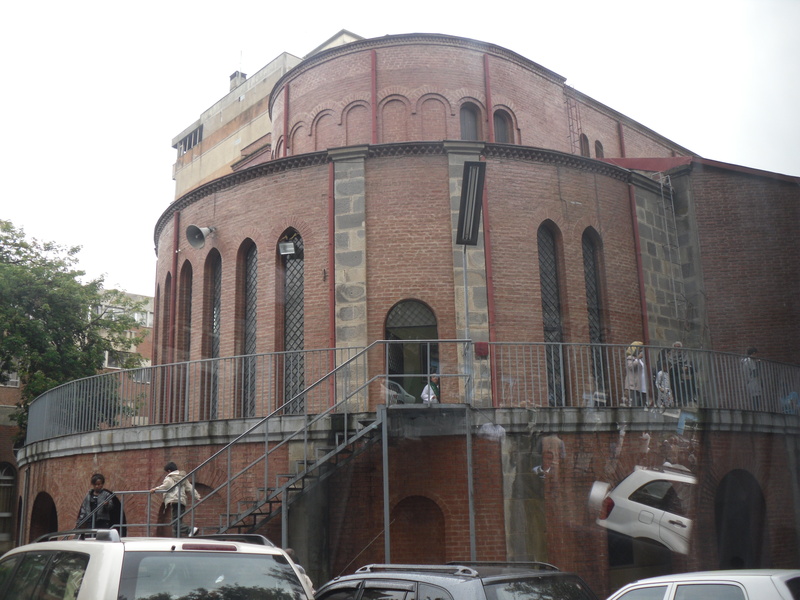 We were able to attend Mass at the beautiful, simple brick Holy Savior church in Addis. The décor, though simple, was warm and the art icon-like. 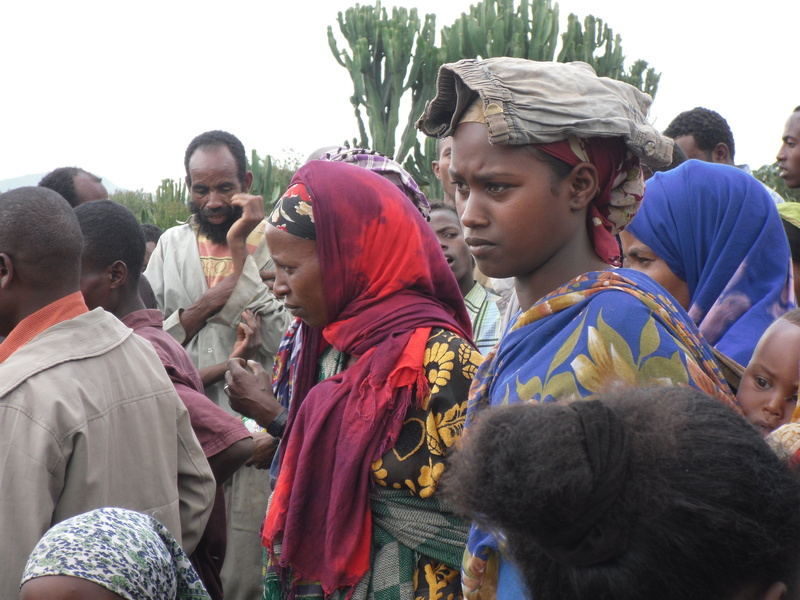 The Mass was said in Amharic, but there was no mistaking the prayers and pattern of the Mass. At communion, the cup was not offered. 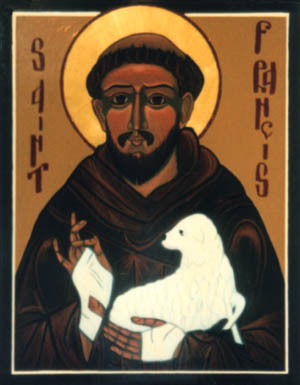 Instead they offered intinction (the dipping of the host in the wine before placing it directly on the tongue). Different, yet always the same — our liturgy speaks to us no matter the language and cultural practices. Happy New Year? 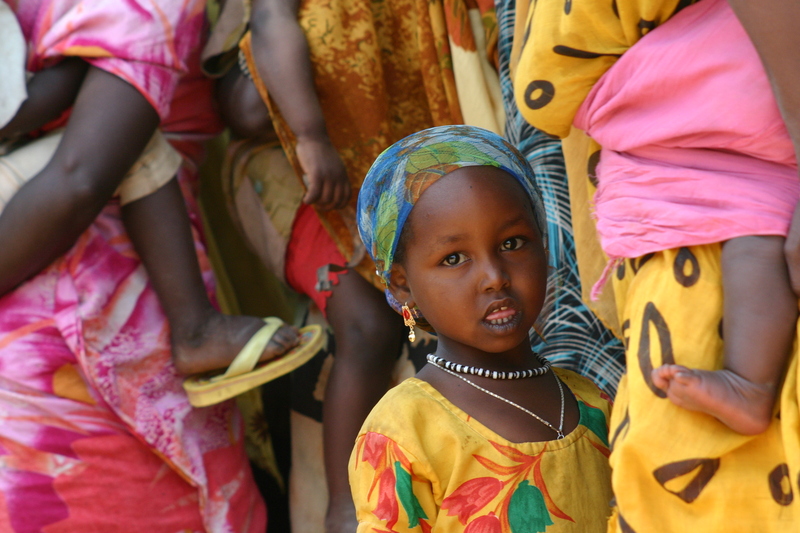 Ethiopia's New Year's Day is Sept. 11 -- the beginning of the 13 month calendar year. By the way, this is actually 2003 in the Ethiopian calendar. 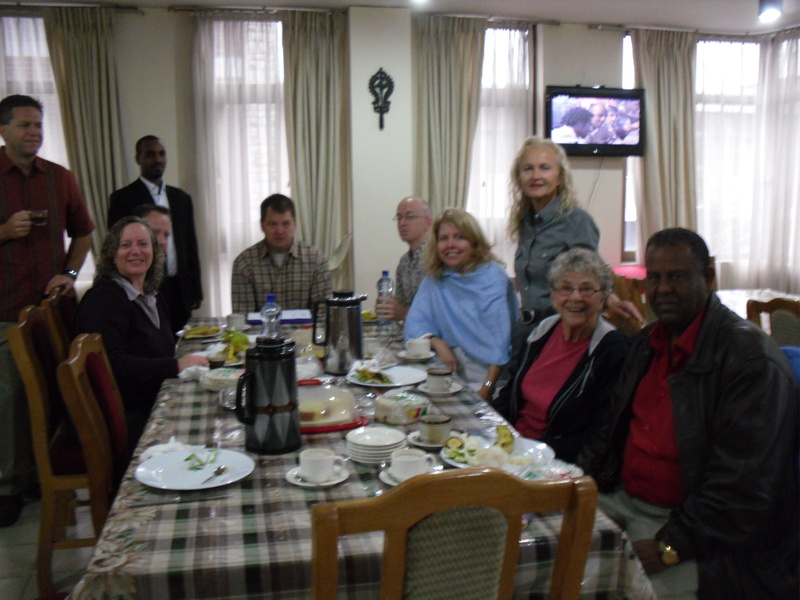 After Mass we experienced our first traditional Ethiopian lunch — the first of several encounters with ingera. Mmmm, ingera. The utility food. 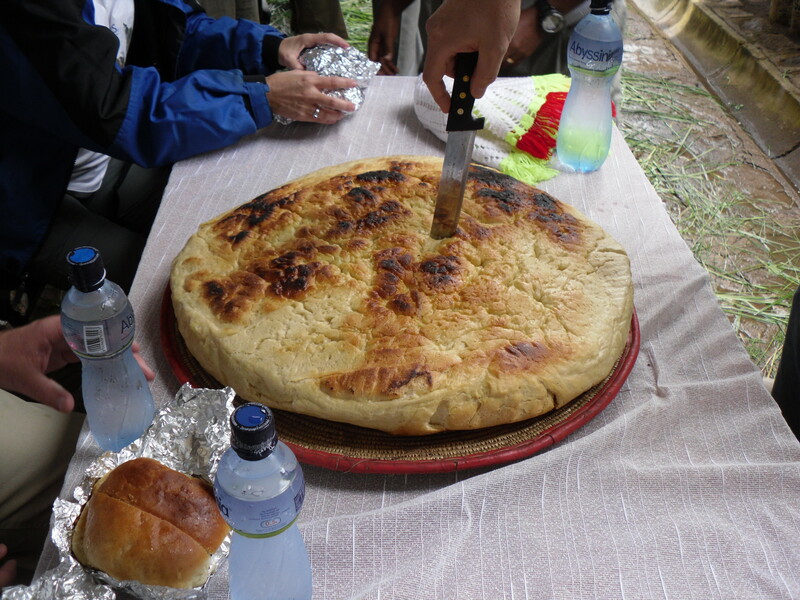 Ingera is a very large pancake made from a native grain called teff (which, by the way, is glutten free). Ingera has a slightly sour taste, a springy, spongy texture and is an “acquired” taste. Formed into a large pancake it covers the bottom of the platter on which portions of sautéed vegetables and spicy stew-like concoctions of meats and vegetables are placed. Smaller pieces of the ingera are rolled up and placed around the platter. To eat, you break off a piece of the rolled ingera and use it to scoop up bite-size portions of the stews and vegetables and pop them into your mouth (ingera and all). No forks, spoons and knives here — ingera is the food and the utensil. Caution: please wash hands before eating and if you have very long fingernails (spoken from experience) be careful how you scoop or you may be picking your stew out of your nails! 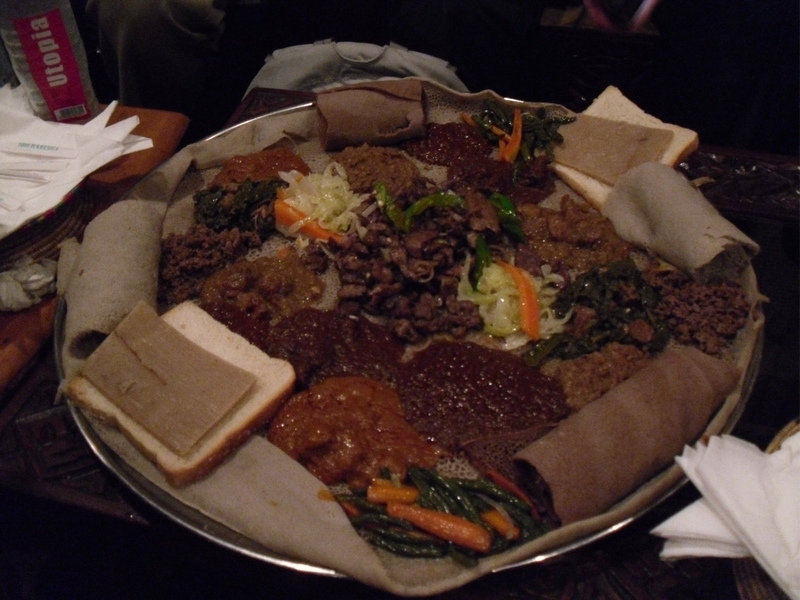 A typical Ethiopian meal of ingera and meat and vegetable stews called "wot." 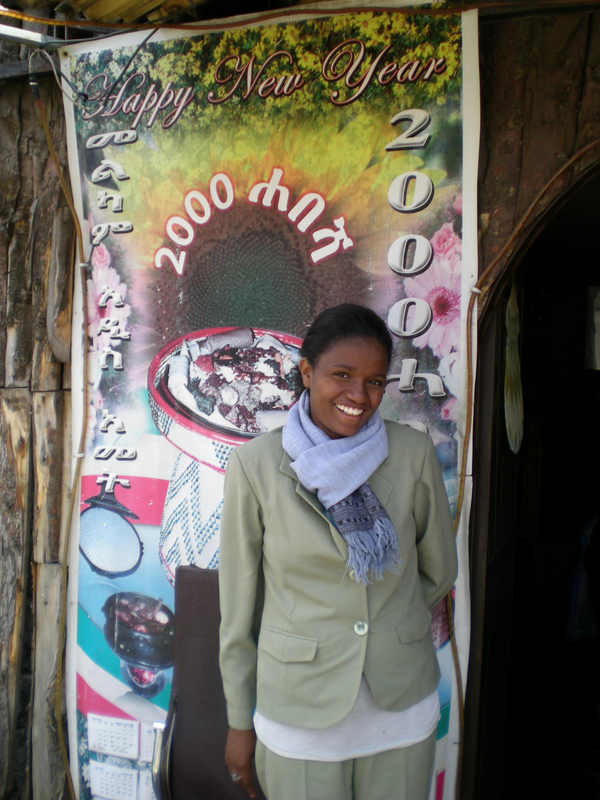 This was our first "official" meal at a local Addis restaurant. That same afternoon (our first day in Ethiopia) we packed up a smaller overnight bag and flew to Dire Dawa, located in the eastern province of Harerge. Ethiopia’s second largest city (pop. 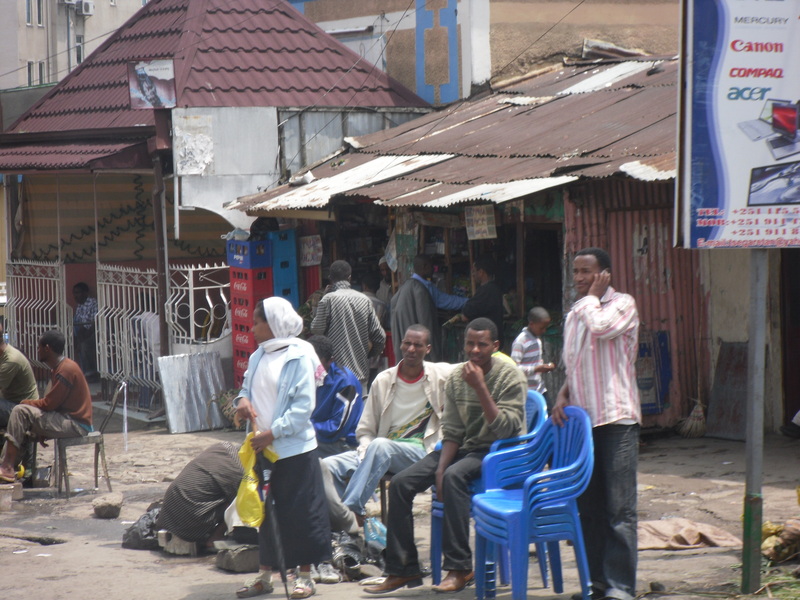 237,000) Dire Dawa is really more of a large bustling town, full of life and vigor. We spent the night at the local diocesan guest house where I had my first incident with a non-flushing toilet. The toilet was modern and all looked fairly normal, except that there was a giant barrel of water next to it with a large water scoop. We quickly figured out that in order to flush our business we had to scoop water into the toilet to make it “flush”. However, I went at it with far too much vigor and the water went in much too fast, down into the bowl and back up and over the side of the toilet seat and on to the floor. And, no, there were no sponges, mops or paper towels to rectify the problem. I emerged, horrified, and explained to my roommate that we needed to be careful because there was now some serious water on the bathroom floor! From the plane heading into Dire Dawa, the second largest city in Ethiopia. 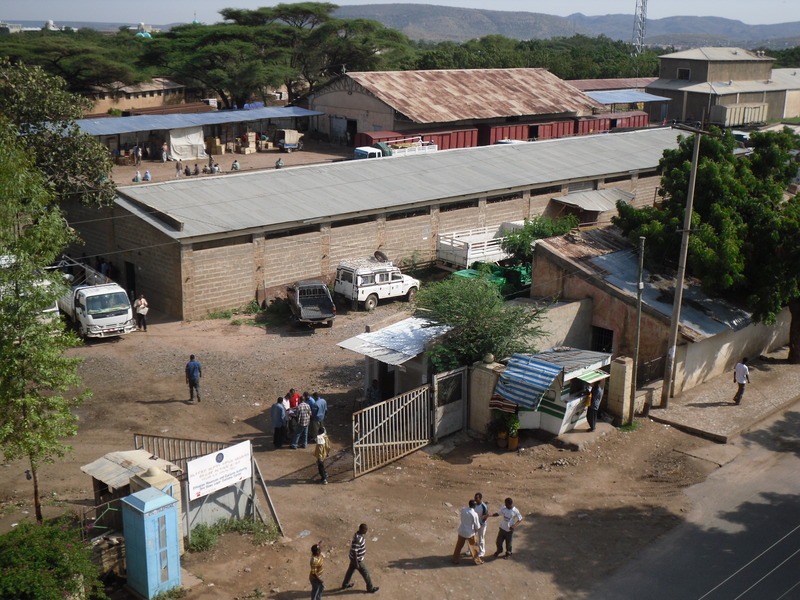 Dire Dawa is the name for both a city and a district (woreda). Taken from my room balcony at the Harage Catholic Guest House. 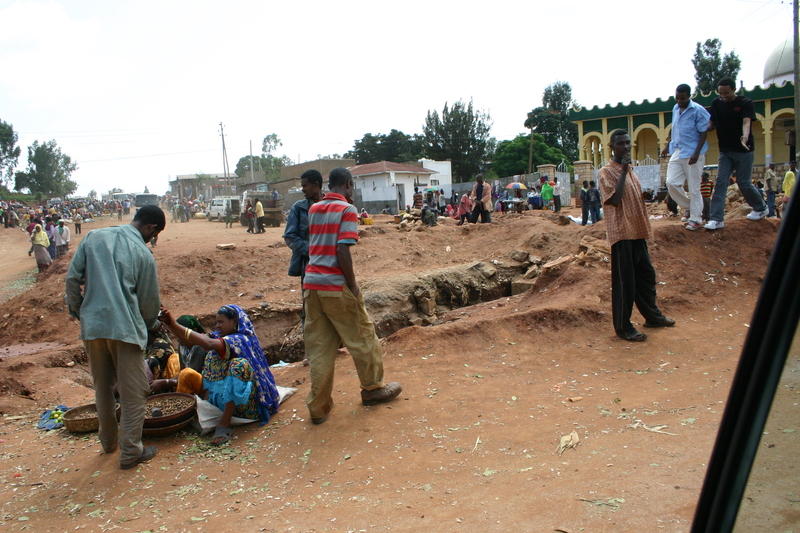 The Dire Dawa marketplace was bustling from sunrise to after sundown. 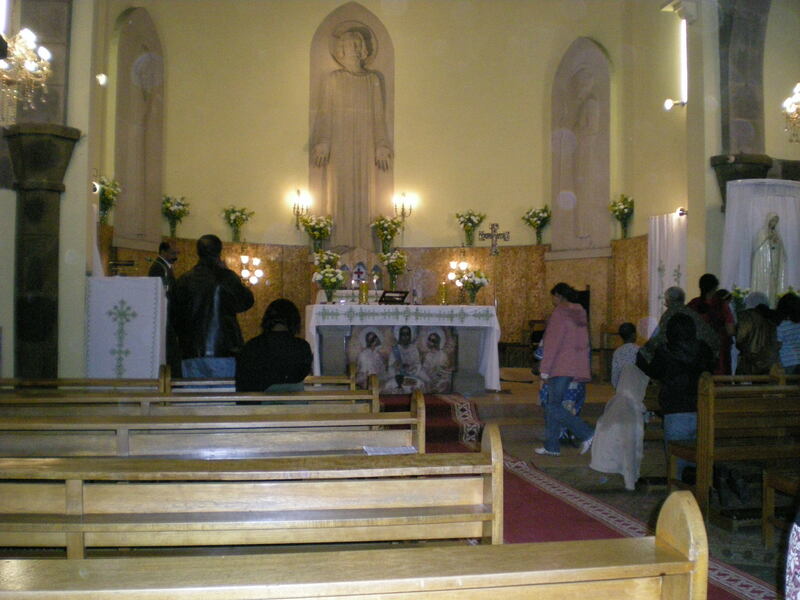 The next morning some of us began our day at Mass at the small local church across the street from our guest house. Another marvelous experience of our faith, as the Mass began with a chanted recitation of the rosary in Amharic. The voices of the young girls, who board at the Catholic school there, filled the church with their clear, melodic call and response. Edified by this and a hearty breakfast we climbed into the land rovers and took off for the mountain villages where we would visit the many water projects that are part of the work of CRS in the area. Breakfast and briefing at the HCS Guest House. Wherever we went the breakfasts were always delicious and filling -- even if the oranges were green but tasty. The process of getting to our destinations was its own adventure. You know how it is to drive down our own town and country roads. All of a sudden suicidal squirrels and chipmunks come darting out into the middle of the road and there you are swerving this way and that to avoid hitting them. Well, think of that on a larger scale. 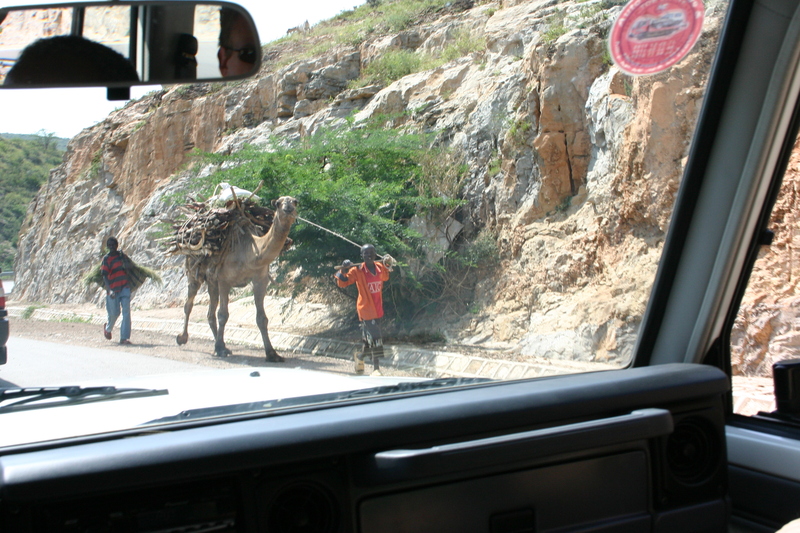 As we drove through Dire Dawa and the villages up in the mountains, we discovered that the roads are for more than just cars (in fact I think that cars are the interlopers). There are tons of pedestrians, bicycles, little three-wheeled cab thingies, horses, donkeys, goats and cows — oh yes, and camels. 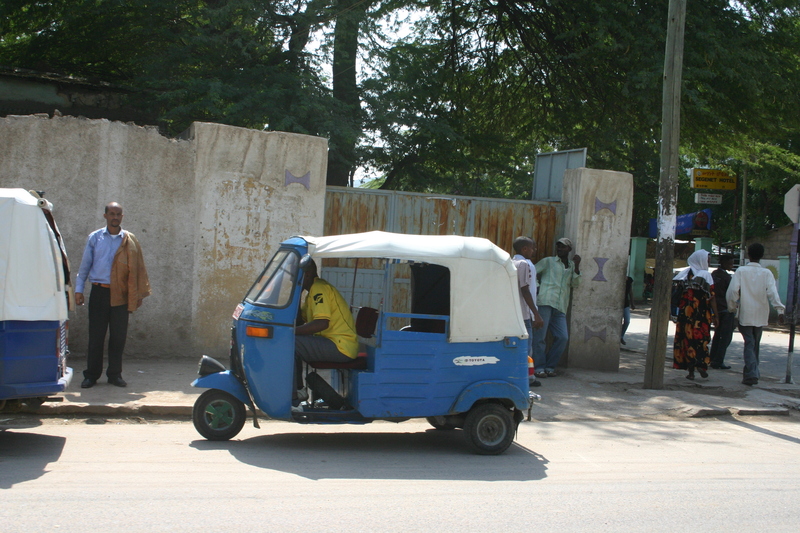 Driving on the roads of Dire Dawa and vicinity was like negotiating a slalom course. And there are camels on the road too. Stopping along the road to meet people. Getting to the water projects meant reaching remote mountain villages by way of roads that weren’t really roads. They were winding, rutted, foot paths through the mountains that looked (and felt) like they were made by rain water gushing down the mountainside. Thank goodness for our land rovers and experienced drivers! 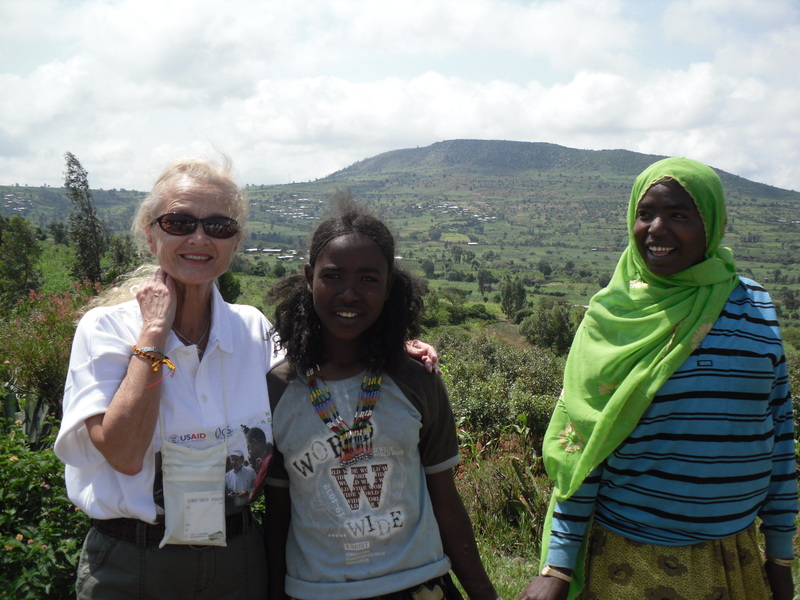 Our arrival in Ethiopia was at the end of their rainy season. The rainy season extends from June to mid September. 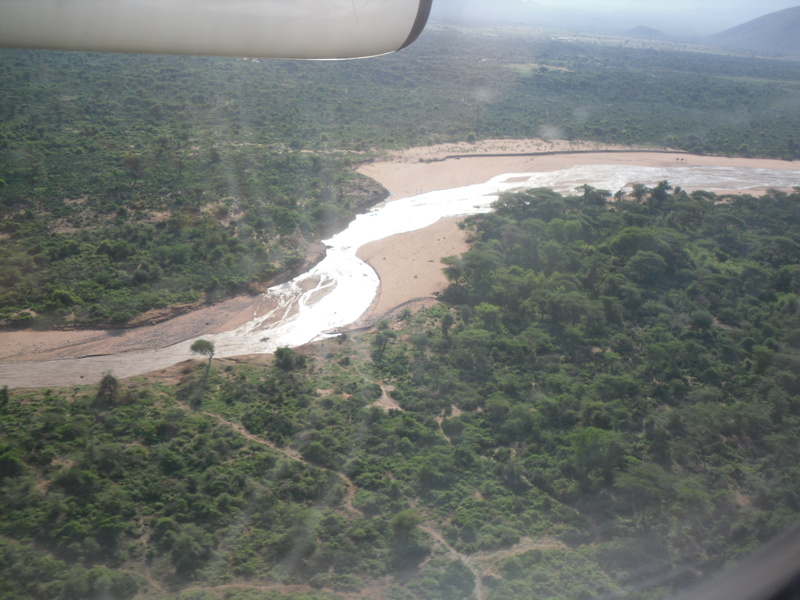 The lush greenery that the rainy season had produced was still visible, but we could already see sections of the hillsides that were beginning to dry out, and all the river beds were completely dry. 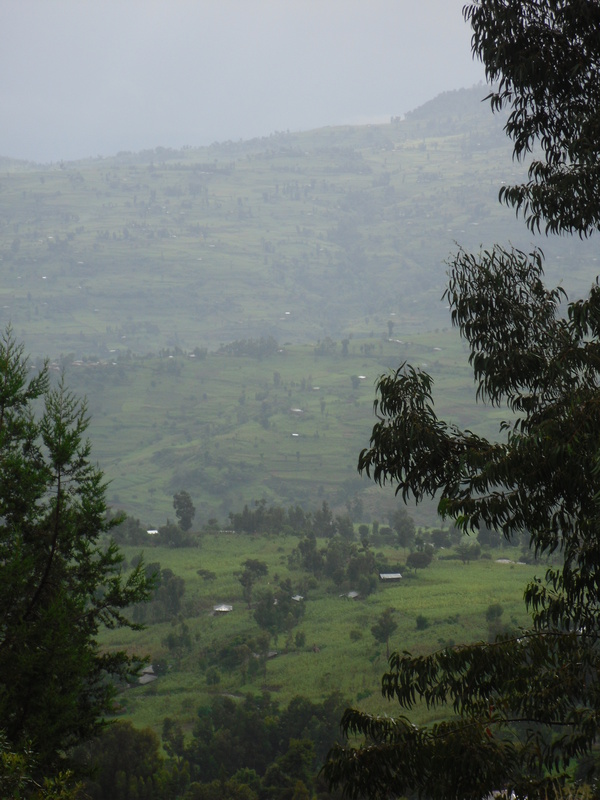 Deforestation, soil degradation and consequent erosion have left huge portions of the country water scarce. Two devastating years of drought have made the issue worse. And this is what we had come to observe – Catholic Relief Services water projects which propose long-term solutions to water insecurity. 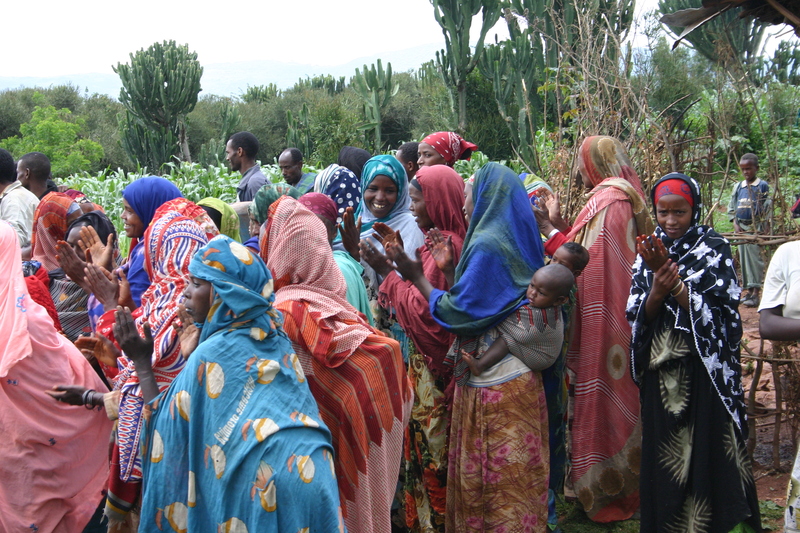 At each water project village we were met with waving and cheering, and song and dance. I don’t believe that any in our group had ever been welcomed with such enthusiasm. This was not the welcome that you give a stranger — or even a guest. This was the kind of welcome one gives a family member or a dear friend. We were overwhelmed by the outpouring of joy. They are a physically beautiful people, who love rich, vibrant colors. They act as a community/group, while being individually retiring (yet curious). The palms of their hands are stained a permanent orange-yellow from working with the red clay soil of the area. Even the hand hewn stones with which they build their homes have that orange tinge. Our group was greeted with singing, laughing and dancing. The welcome and desire to celebrate with us was extraordinary. Singing and clappingWhenever we gathered with the villagers, they spent time explaining their projects and wanted us to take lots of pictures of them and with them. We didn't need to be encouraged, because we couldn't resist photographing these beautiful people.Young women of the villageEjaneni, EthiopiaVillage women and children of the Goru Gutu District.More villagersWe followed the villagers to water sites. 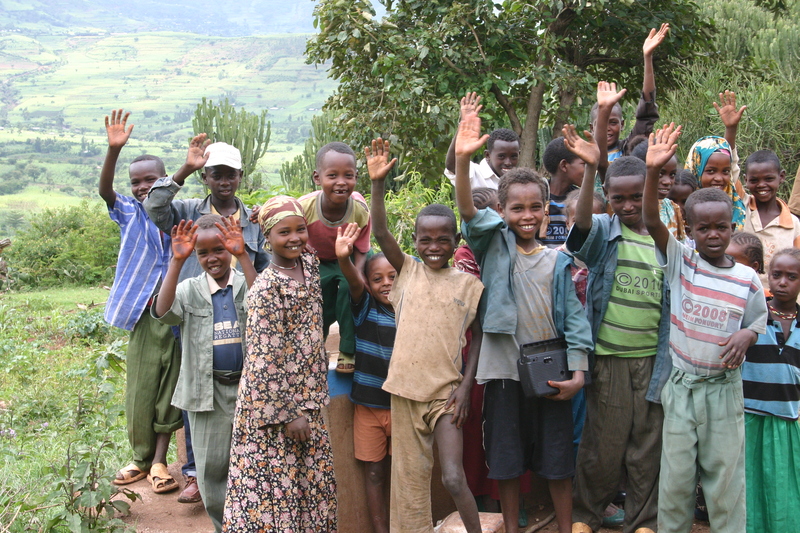 The people would wave at us along the road, as we approached the village. The palms of their hands were always stained the same color as the earth, a yellow-orange. Teff plants -- an indigenous grain of Ethiopia and a staple for the infamous ingera pancake (also referred to as Ethiopian flatbread). 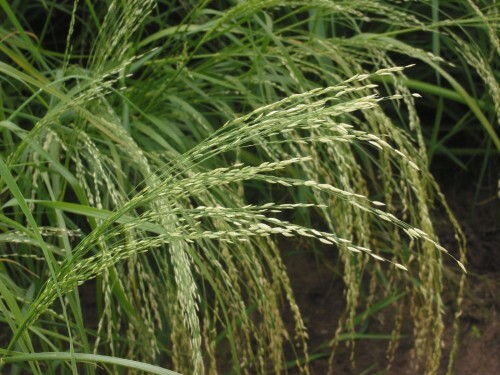 Teff contains twice the amount of iron than the equivalent amount of wheat or barley. Also, the yeast is on the grain, so it does not need added yeast and it is gluten free. The villages are simple, with small huts mostly made of hand-quarried and cut local rock. The roofs are generally grass-thatched or corrugated metal. 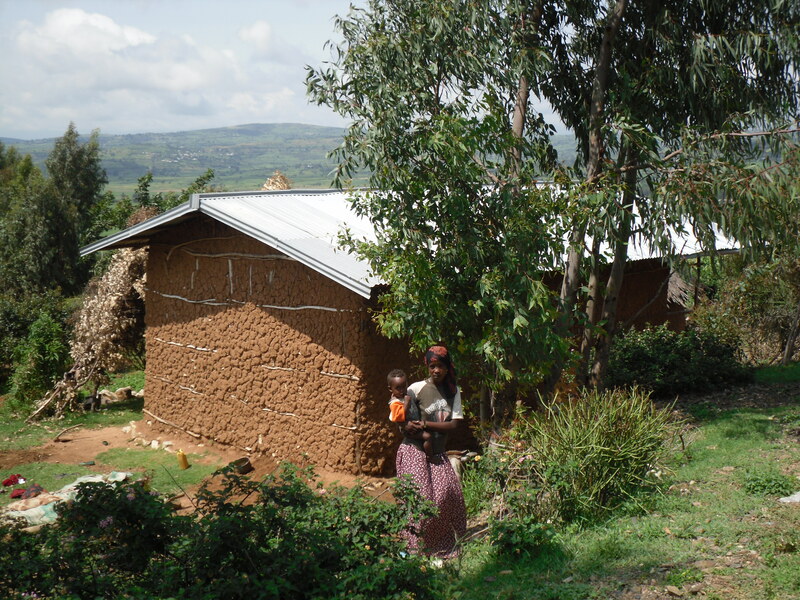 Homes are small and do not contain much more than basic utensils and mats for sitting and sleeping. The mountain villages are different than the little towns along the main road. The villages are made up of small homes and a few animal shelters. Grocery stores, restaurants, etc… are located in the towns miles away. Men, women and children make that walk every day. 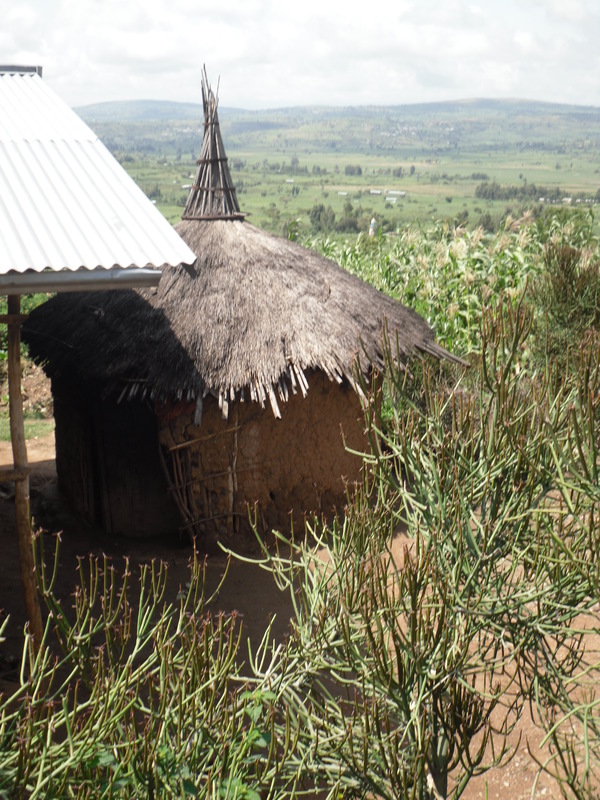 Many of the homes in the Goru Gutu district have a secondary, small round, thatched-roofed hut next to the primary shelter. Typical of many of the village homes constructed of hand-quarried and cut rock. The yellow tint of the rock is reflective of the color of the local soil which varies from a yellow-orange to a deeper orange-red. 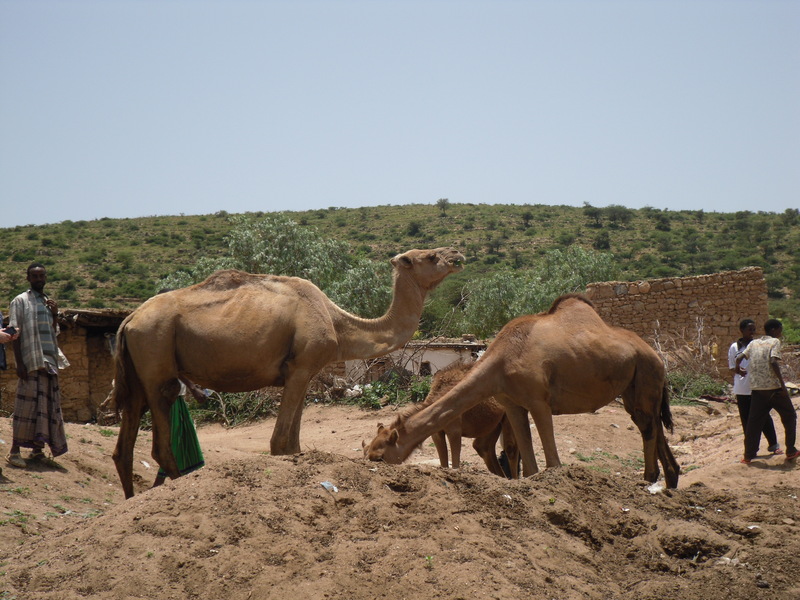 Though donkeys are used as the major pack animal, camels do a lot of the heavy duty carrying. 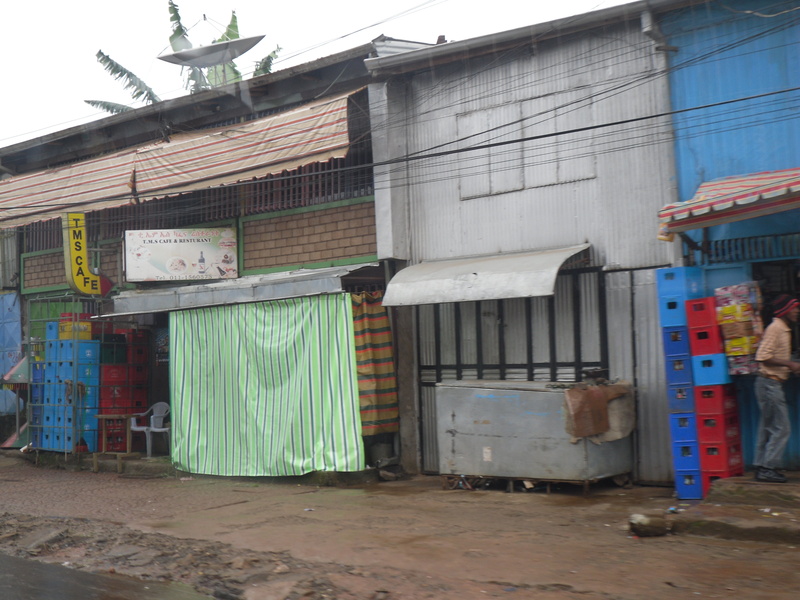 Villages are made up of a few homes and animal shelters that have been grouped together. 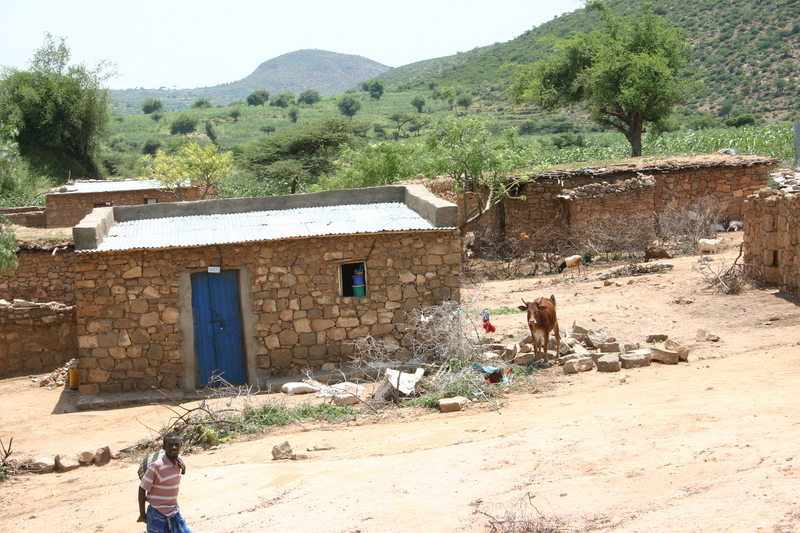 The homes are local quarried rock with roofs of corrugated metal and/or a thatch of twigs and grass. 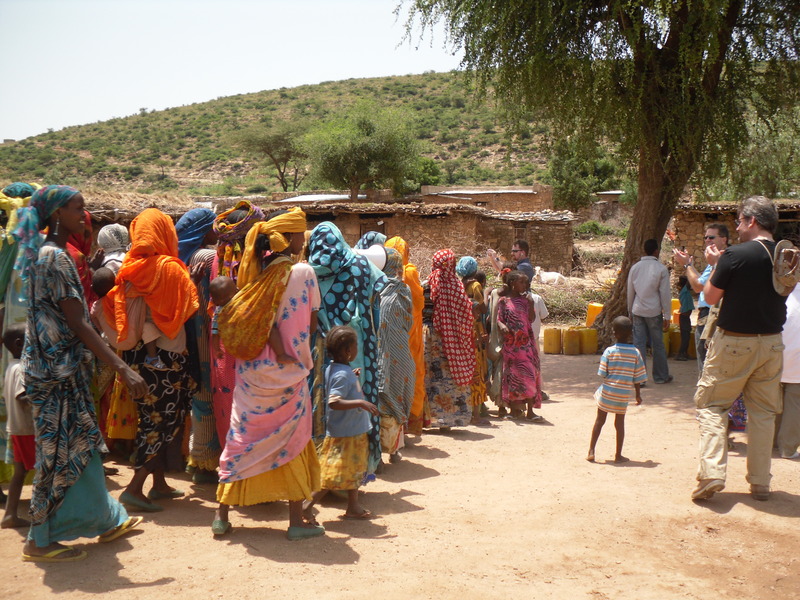 The water projects were what brought us to these villages. The projects are amazing because they are excellent examples of the level of collaboration that CRS seeks in ensuring successful long-term development. And, secondly, because the projects seek to address multiple issues and integrate their solutions in a way that will effect comprehensive change in the lives of the villagers. 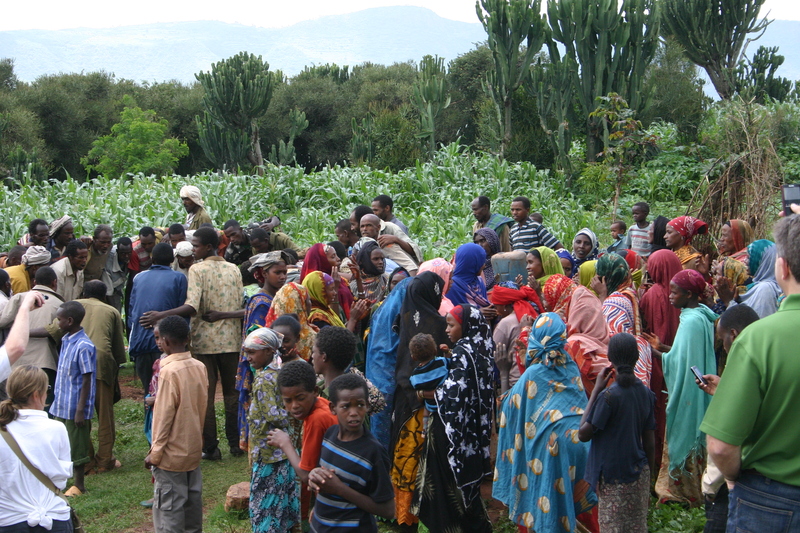 Collaboration with local partners is the hallmark of Catholic Relief Services projects overseas. 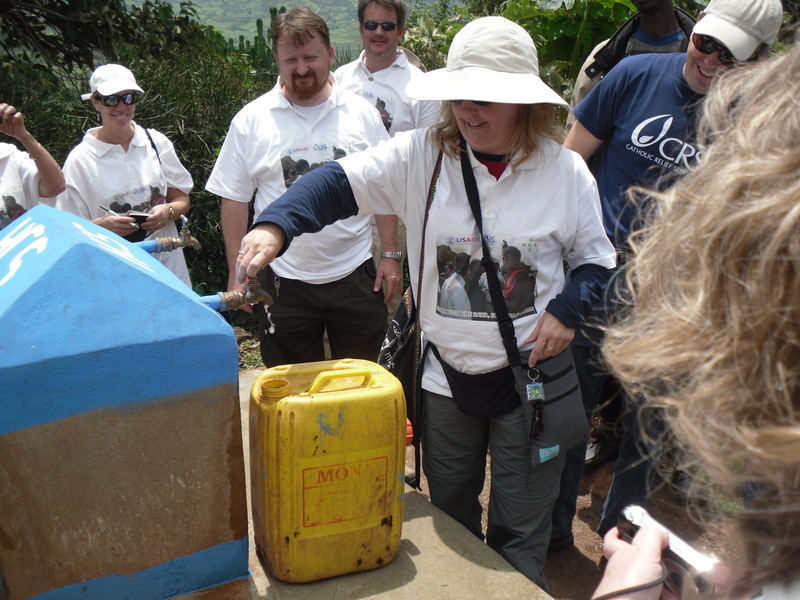 For the water projects, CRS formed partnerships with the local Hararge Diocese, the villagers, and the local authorities. 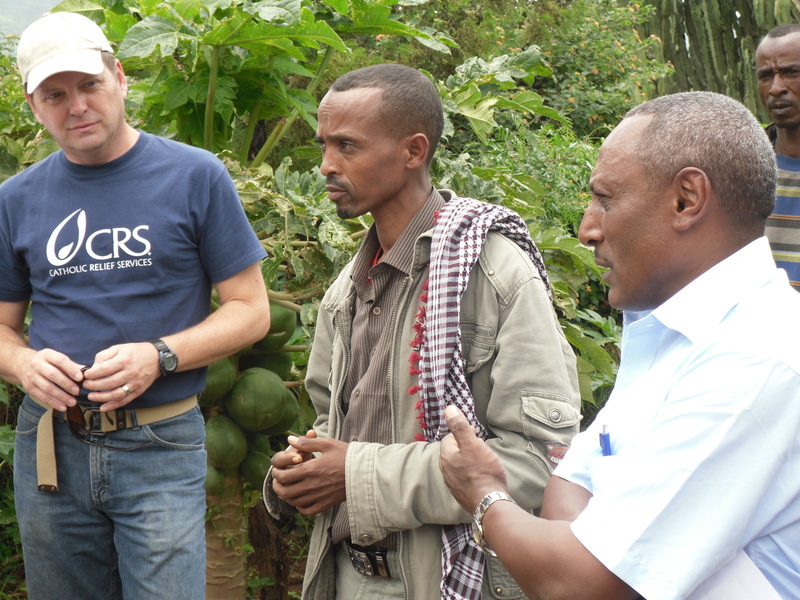 Though CRS provided a lot the technical and monetary support, identifying of the issues and their solutions was the result of true partnering at all levels. As a consequence, the villagers who benefit from the project have been involved in its planning and implementation from the outset. They own the project, maintain it and make on-going decisions on how best to sustain it, with on-going technical assistance from CRS and the diocesan partners. Partners in Development, from left, Lane Bunker CRS in-country program director, village leader, and Zemede, Harage Catholic Services. Harage Catholic Services members and village leaders explain the projects to members of our CRS diocesan directors' group. 1. Water stations for people that are operated by tap. No water sits in open basins where contamination and disease can develop. 2. Water stations for livestock. In one of the areas we visited there were three “people” water stations, three livestock stations, and three washing stations to serve approx. 375 families. 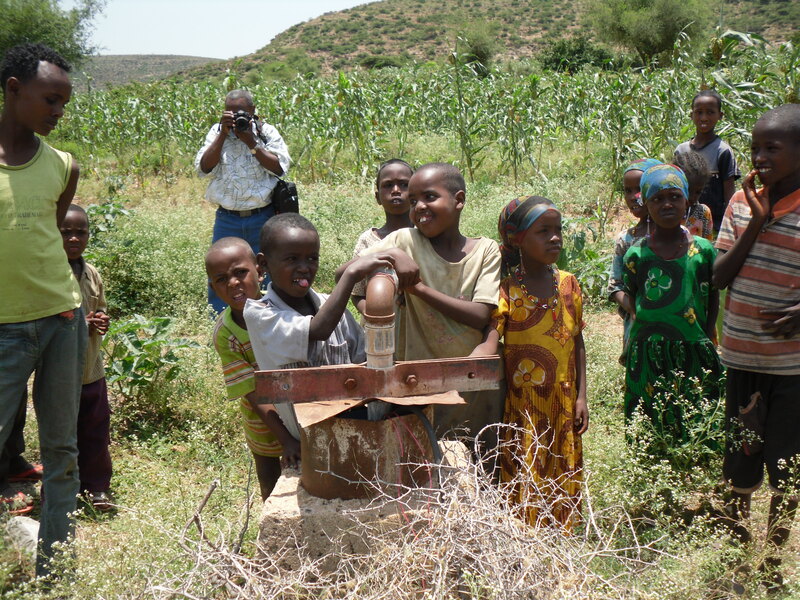 In Ejaneni, the water bore hole supplies 2300 households and 1500 animals through its system of water stations. Making our way down to the irrigation/fish pond (pilot project) portion of one of the water projects. Cement bunker protecting the water source of one of the springs. 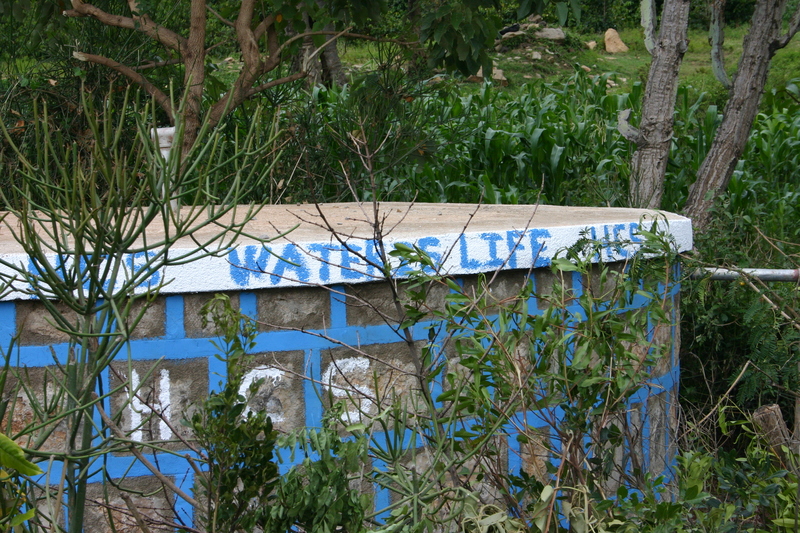 The message is clear that "Water is Life." 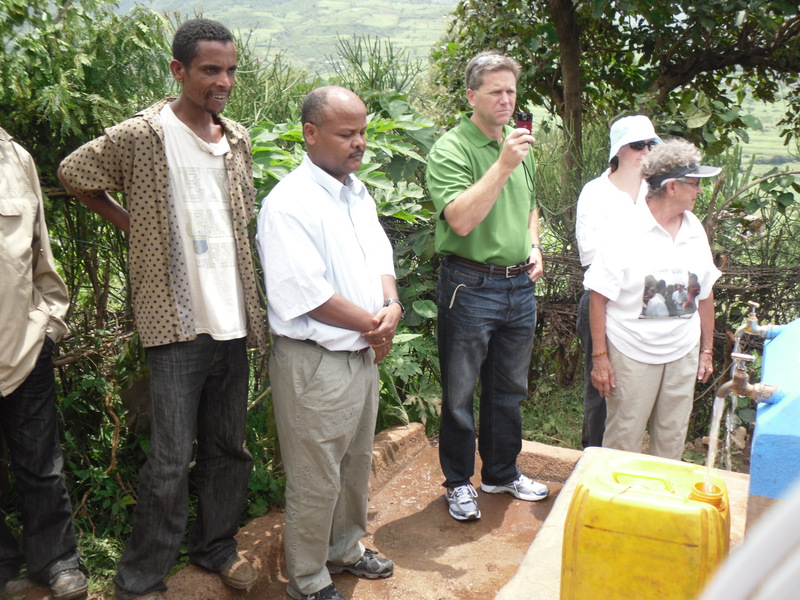 Testing the village water station. From spring to tap, the water is protected from bacteria and other contamination. 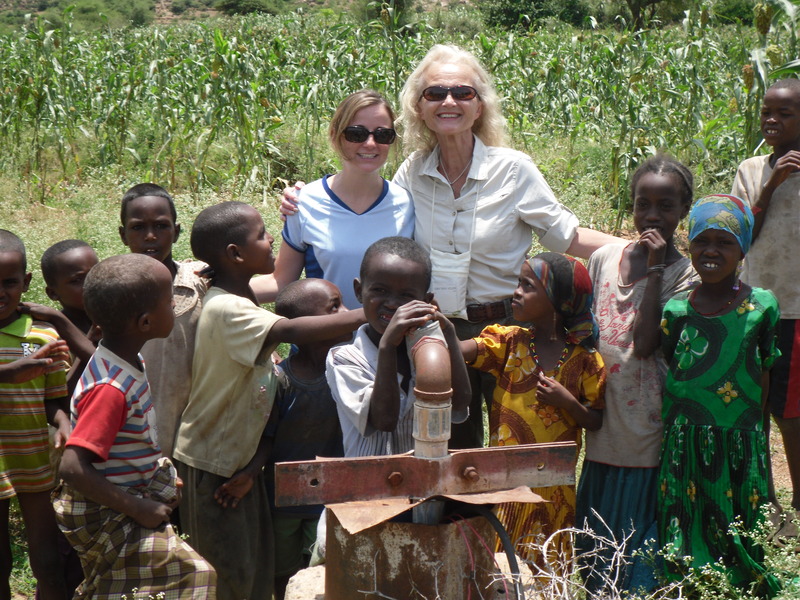 New friends at the water project in Ejaneni. 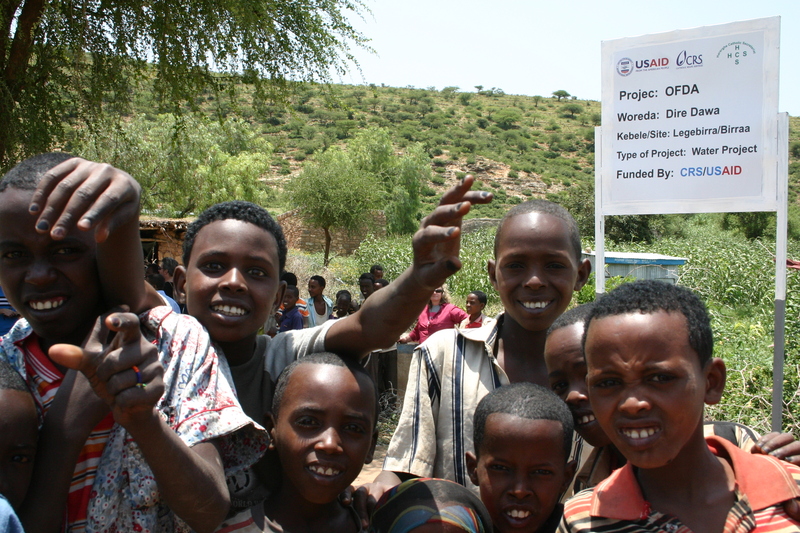 In Ejaneni -- children are always attracted to water (and cameras)! Proper land and water management is key to the maintenance and increase of the water sources. Through deforestation and denuding of the land of the plants which preserve the top-soil, the land here is severely degraded. 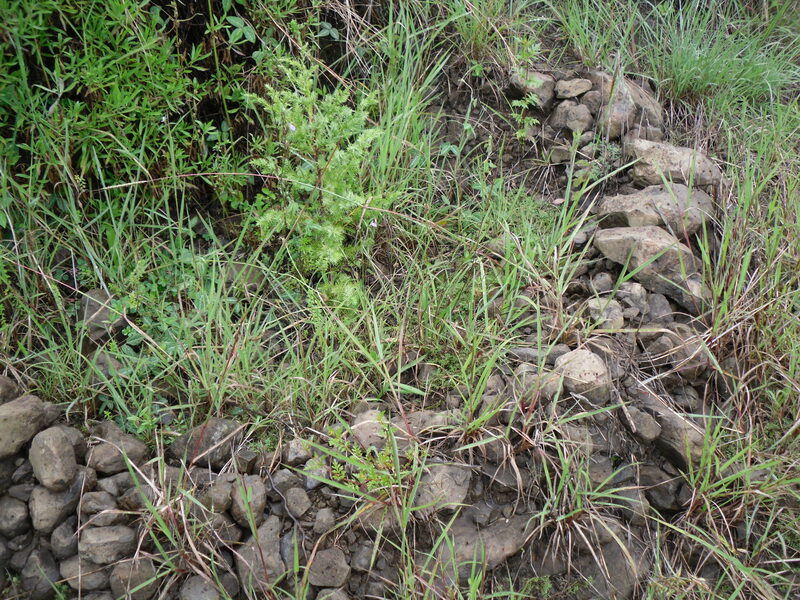 When it rains, the water rushes down the hill sides, continuing to erode the already fragile soil. River beds run and then just as quickly dry up. Water does not seep back into the ground. As a consequence with less and less ground water, the deeper the wells have to be dug and the more quickly water sources can be used up. To address this issue, part of the water projects’ goal is to re-establish watersheds. This is done by introducing terrace farming as a means of soil conservation and prevention of rapid surface runoff of rain water. . A terrace is a leveled section of a hilly cultivated area. Multiple terracing up the hillsides gives a stepped appearance to the landscape. Within the terraces, mini water catch basins are constructed to intensify the effect. As the soil begins to recover here, little trees are planted in the catch basin so that their eventual root systems will more naturally shore-up the hillside soil. 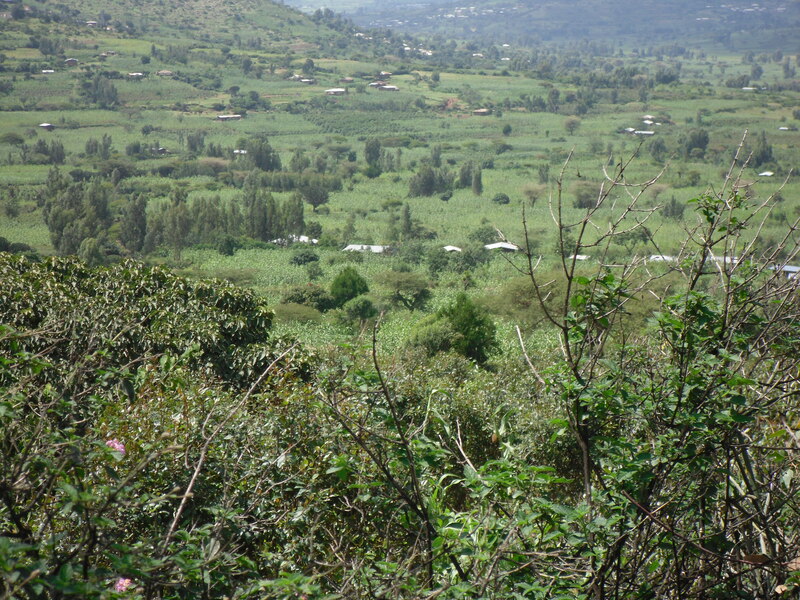 The success of this kind of land management was evident in our visits where, in one instance, it had actually increased the output of the original water source. 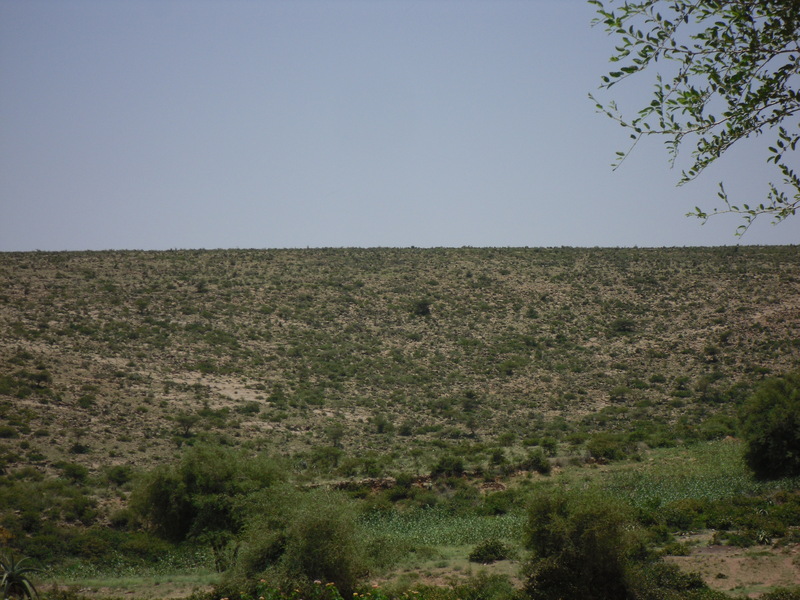 To further preserve these land reclamation areas, livestock has to be kept away. Cows and goats will eat the tender new vegetation. 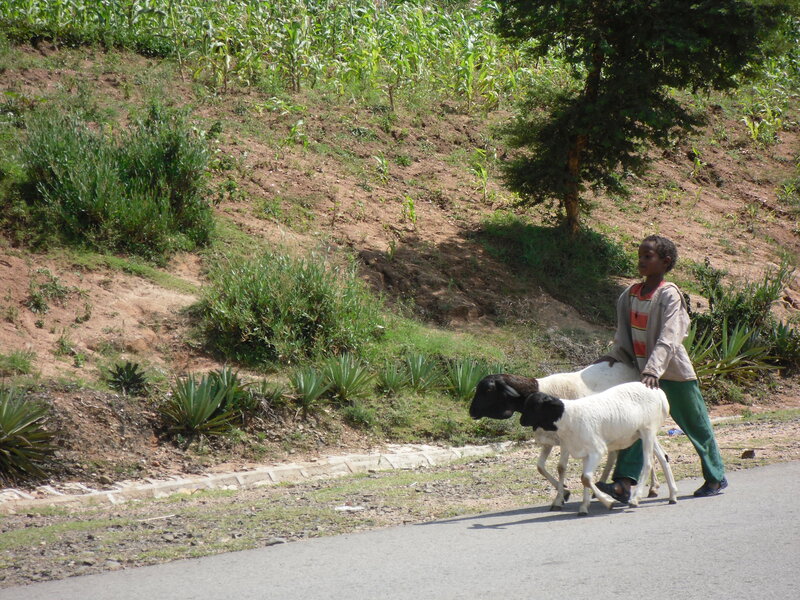 To combat this, the villagers came up with their own plan: If your goat is caught in the area, you will pay a 10 Birr penalty (Birr is the Ethiopian currency). 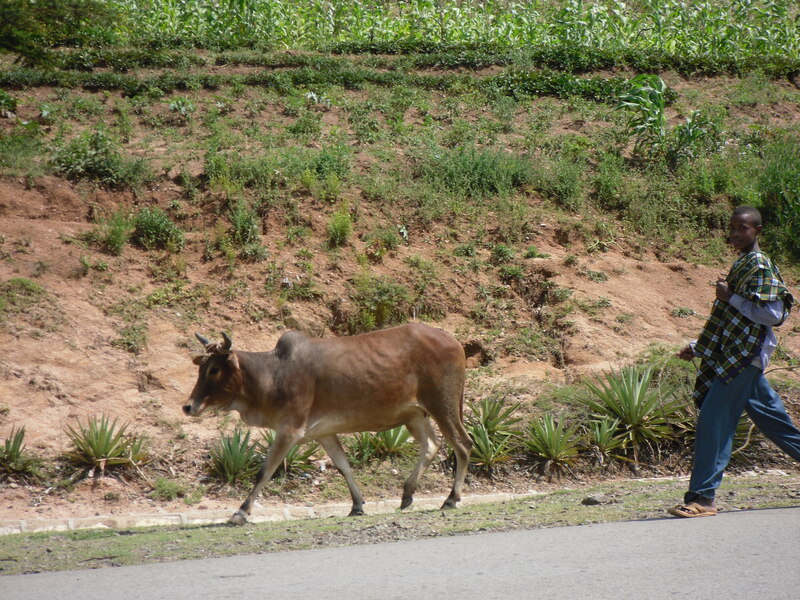 If your cow is munching in this area, you pay 30 Birr. It seems to have been prettyeffective. 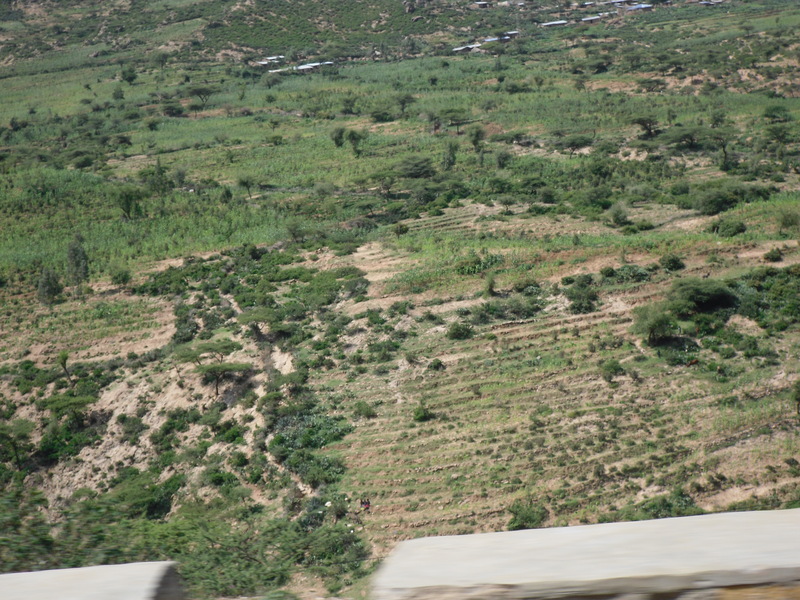 As we were coming to the end of the rainy season, many of the hillsides without land/water management were already showing signs of how dry and barren they are. 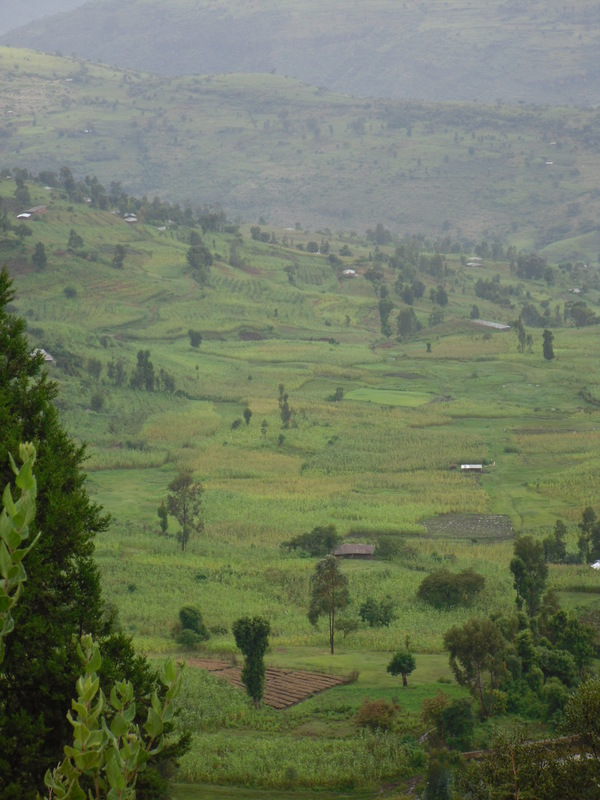 This is an example of one of the hillsides on which terrace farming has been introduced. It will take 3 to 5 years for the terracing to produce the desired fertility and lushness. In other areas of the countryside, where land/water management has been in effect for about three years, it was easy to see the change in the productivity of the land. An example of a mini-water catch basin with a baby tree just recently planted in the middle of the basin. Along our way we stopped at one of the Diocesan supply compounds and were treated to as “Happy New Year” cake. The consistency was more bread/cake and, unlike our cakes, there was no icing — just the wonderful taste of freshly baked cake. 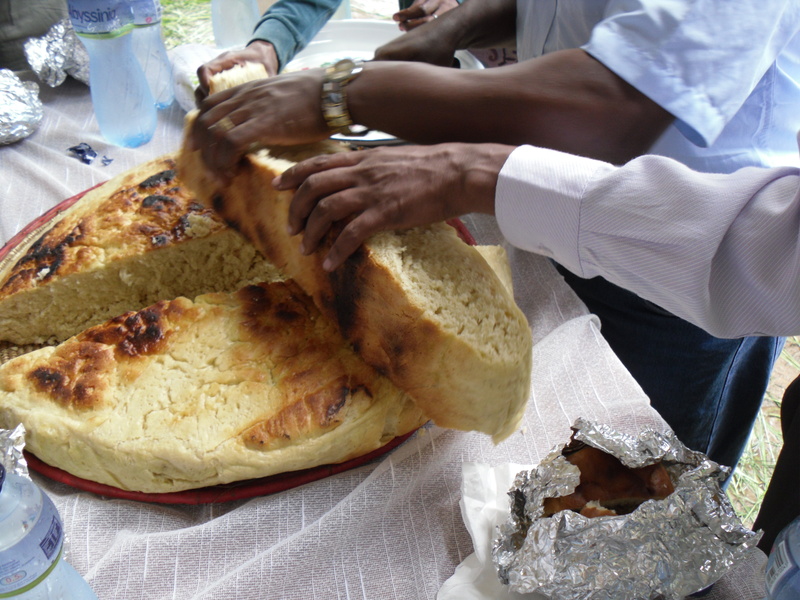 Workers at the Karmaile HCS compund baked a delicious cake/bread, a traditional food for the New Year. New Year cake/bread. No icing on this cake, just the delicious taste of freshly baked cake -- with a more breadlike texture. Not very sweet either. 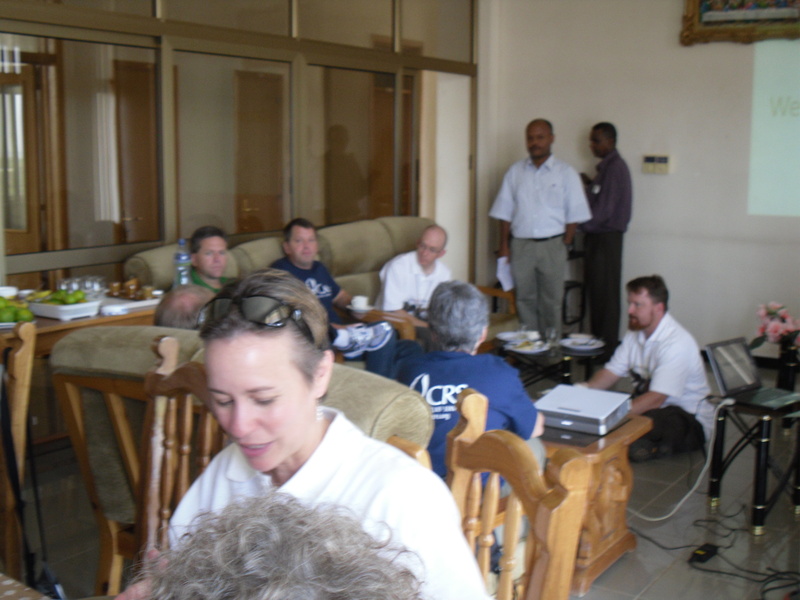 That evening, back in Dire Dawa, we shared a roof-top dinner with the Bishop and senior diocesan staff. More marvelous stews of meat and vegetables (including a raw beef mixture – which we were cautioned not to sample) and of course, plenty of ingera. After visiting more villages on our last full day in Dire Dawa we joined the Bishop in the historic walled city of Harar for tea/coffee at his home and a tour of the Cathedral. The cathedral was very small and simple — not at all like the more ornate cathedrals we might have expected. 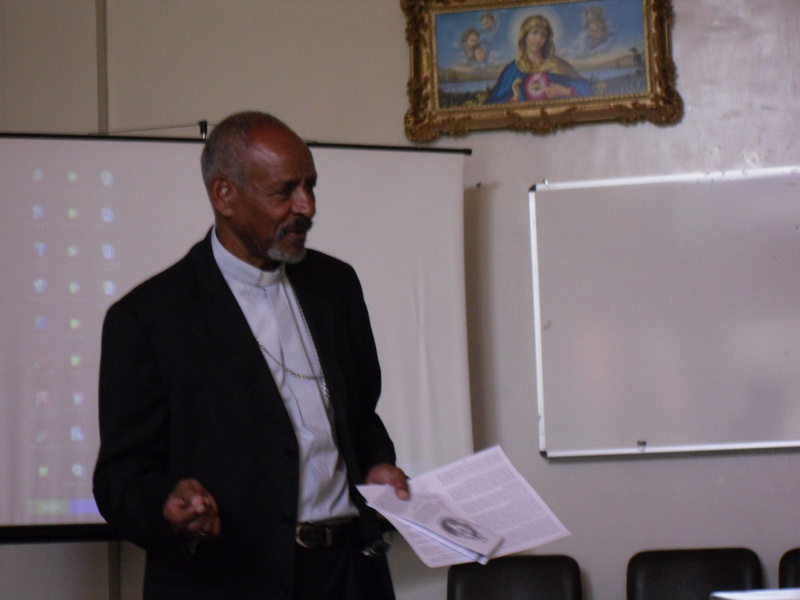 Bishop Woldetensae Ghebreghiorghis, Bishop of the Apostolic Vicariate of Harage, spends some time with us explaining the many developmental projects that he and his diocesan staff have been implementing with CRS collaboration. 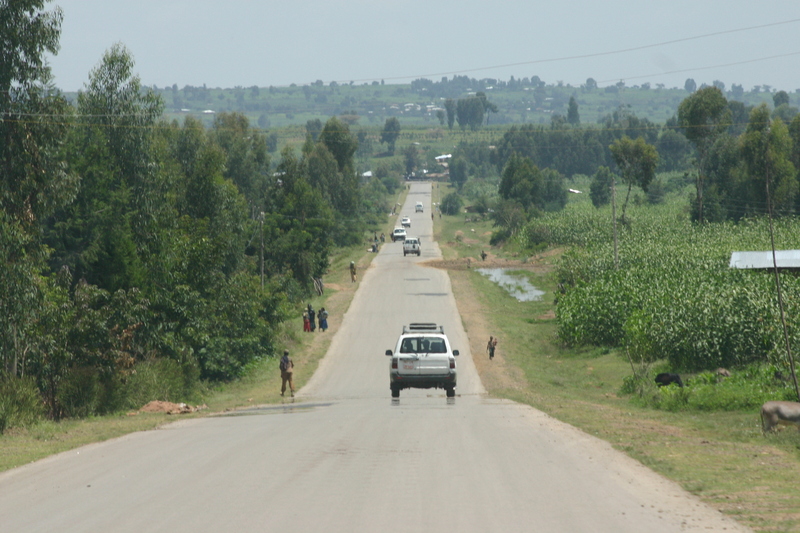 On the road to Harar. The only road we experienced that was straight, reasonably well-paved and not teaming with people and livestock (at least until we entered town). 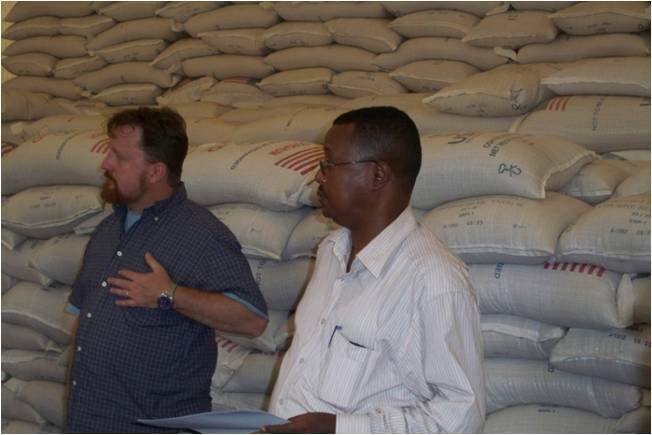 On our way out of Dire Dawa we stopped at the PDP – CRS Central food Warehouse. 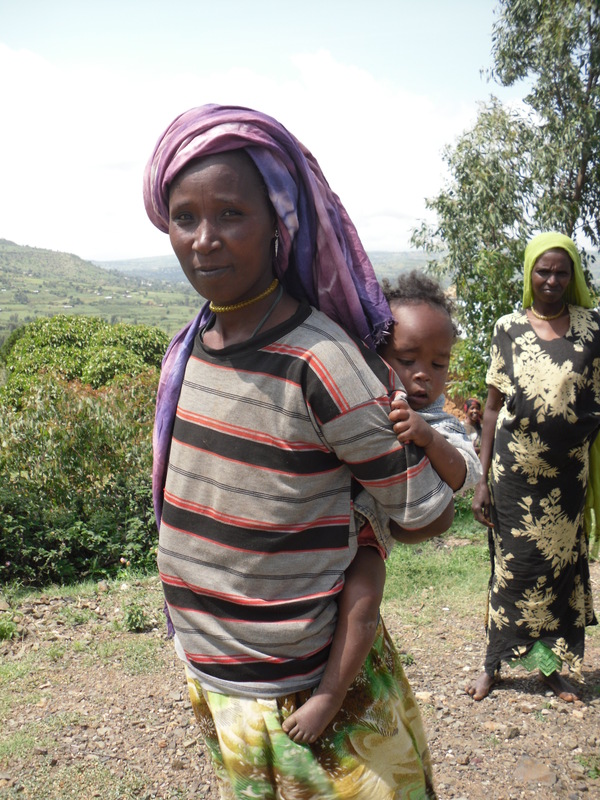 Though much progress has been made with projects that promote development and self-sufficiency, the reality is that in areas like this region, food supplies are needed for times of scarcity. The CRS Warehouse is a series of enormous buildings that are stocked with bags of grains )rice, wheat and sorghum), pulses (variety of dried beans), cans of oil. CRS and its partners are prepared for the on-going immediate needs of the population. Our exit from Dire Dawa was an adventure in total frustration and resulted in a couple of members of our party becoming ill (we also came up with a remix of a song we called “Welcome to the Hotel Dire Dawa) But that is a story best related in person and with a good sense of humor. That aside our visit to Ethiopia was a mind and heart opening experience and truly one that I would not have missed for anything. Amasagnalahu (thank you in Amharic) to Lane Bunker, CRS in-country Director, and the members of the CRS and Harage Diocesan staff: Bahailu, Hailemichael, Zemecha, Zemede, Bekele, Tarekh, Zeneba and Camal. And to our beautiful, welcoming Ethiopian brothers and sister a special THANK YOU!! 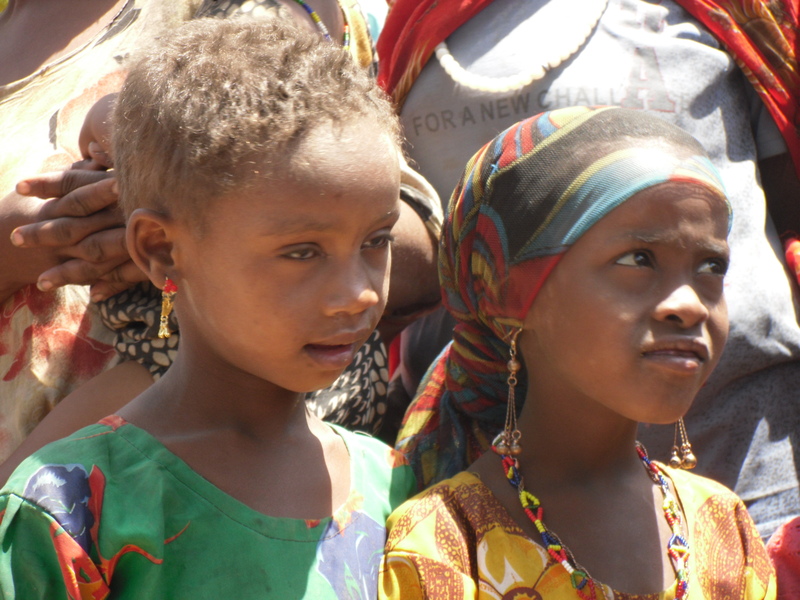 Beautiful, inquisitive faces of the children -- Goro Guru district. Young men of the lowlands -- so anxious to have their picture taken. But you must show them the picture immediately so they can see themselves and laugh. 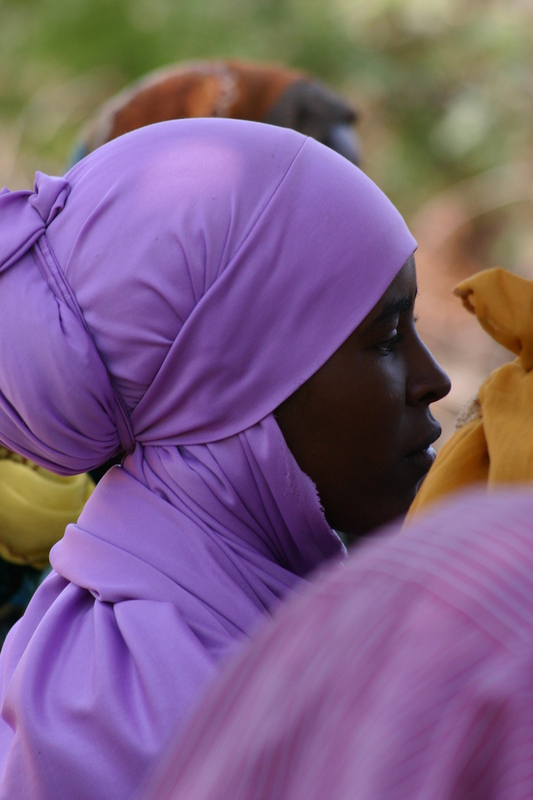 Watch for more reflections on my African journey in a future blog….. 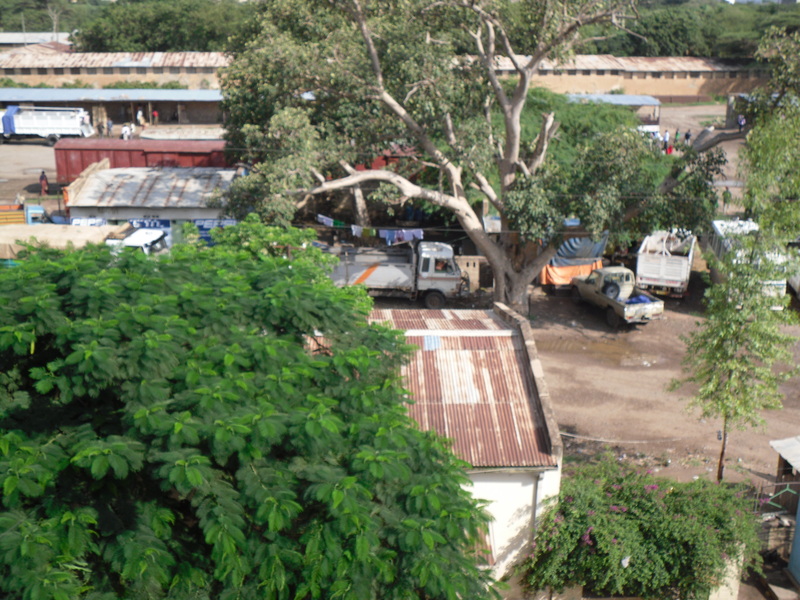 Interior of the CRS/DPD Central Food Warehouse located outside the Dire Dawa airport. With approximately ten warehouses full to capacity, CRS is prepared for the food emergencies and on-going food insecurity needs of the population. 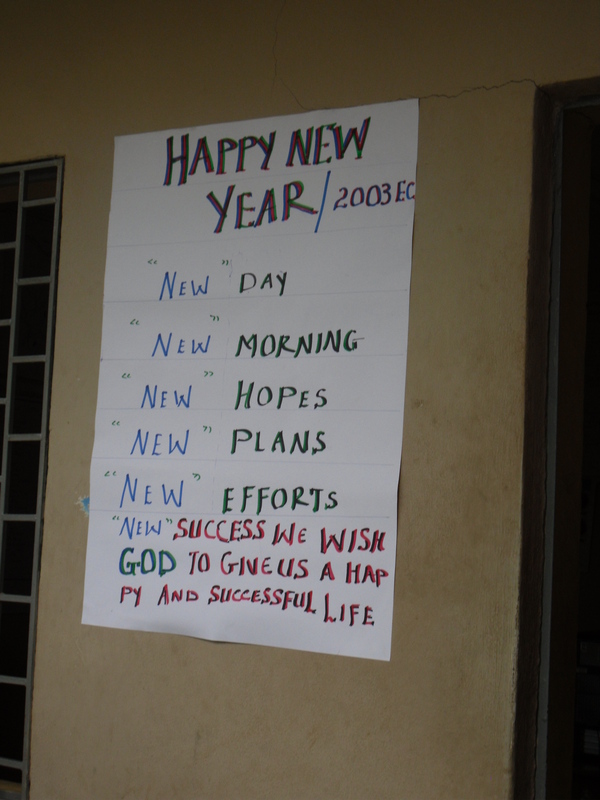 Celebrating the New Year (not just a one day celebration) at the Karmaile HCS main office compound. Christopher Columbus was an explorer who believed in God, himself and others. During our Columbus holiday weekend that highlights his courageous accomplishments many centuries ago, we present-day Disciples of the same Lord Jesus embarked upon our own journey of Faith, seeking our own outpouring of divine grace . 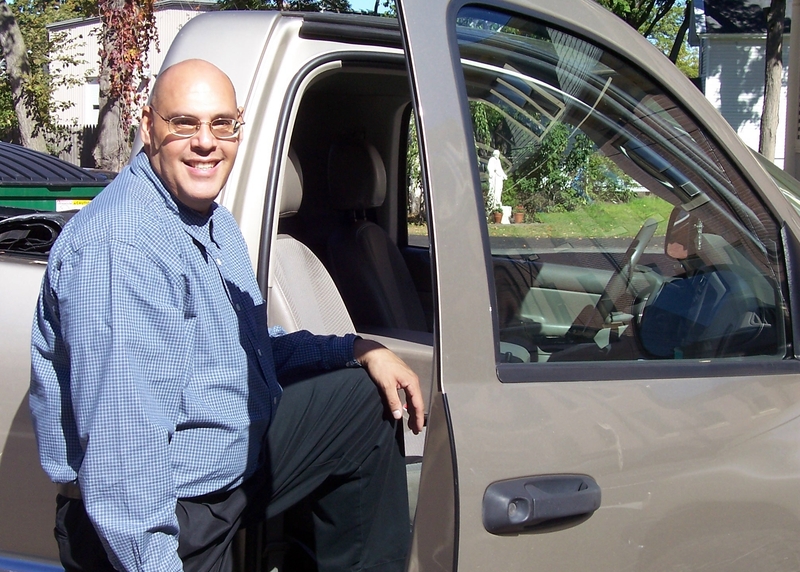 Here we find Mr. Juan Soto getting ready to depart St. Mary’s Parish in Westfield, where he worships with his wife and three daughters. It is no coincidence that St. Joseph proudly stands behind, giving firm approval. We are departing in God’s name to join fellow human beings who happen to possess intellectual and/or physical limitations. 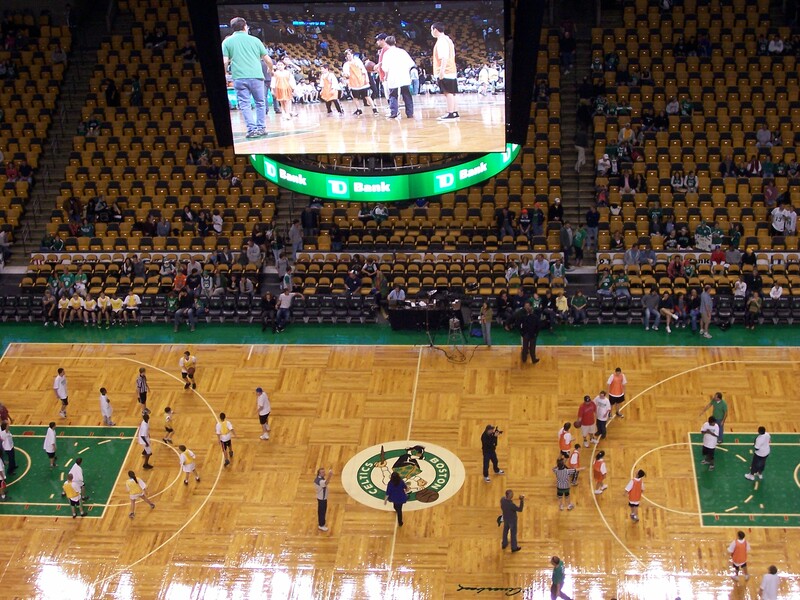 Within a matter of hours, we will be playing basketball upon the parquet floor of Boston’s TD Garden. Yes, we are talking about the court of the fabled Boston Celtics! Praise the Lord! 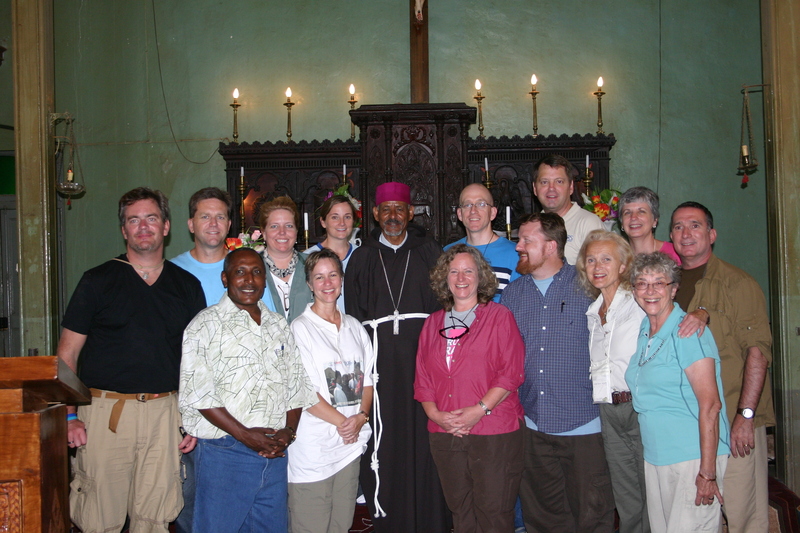 After gathering at the Riverside and Boston College stations, we depart as a group for continuous fellowship and safety. Since it is a Sunday afternoon, the crowds, cars and traffic are not as numerous as usual – and we are grateful! After an hour plus ride, we arrive at our destination. With the “Bunker Hill Bridge” proudly rising in the rear, we climb out of the subway tunnel into delightful Fall weather, under crystal blue skies. God is good! Now it’s time to eat . 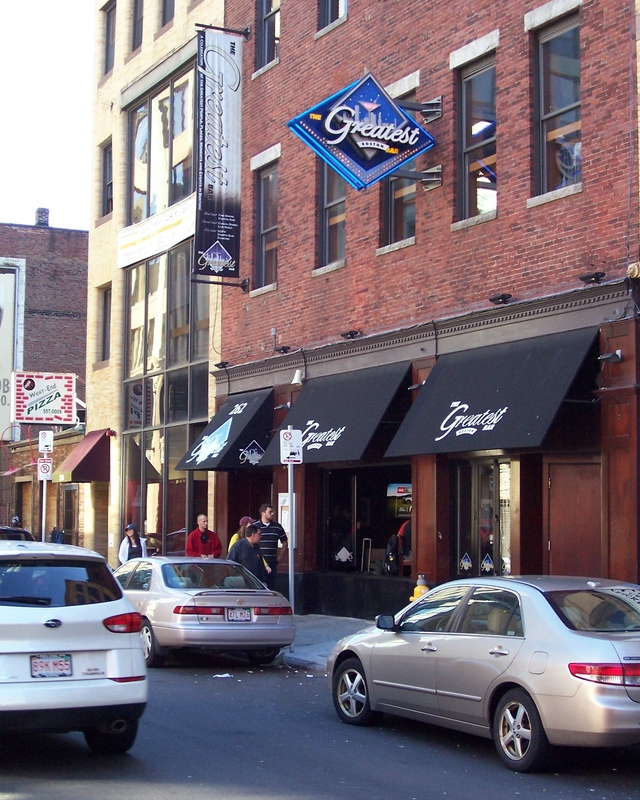 Warmly welcomed by a popular sports bar/restaurant apply named, “The Greatest Bar” (on Friend Street), we enter and begin socializing and rejoicing. The owners of this establishment kindly gave us free food and unlimited drinks, which was a great blessing! We were 100 strong on the fourth floor: parent, friend and child alike. Our beloved Boston Celtics would be playing the Toronto Raptors in less than three hours . . . . So much to talk about! 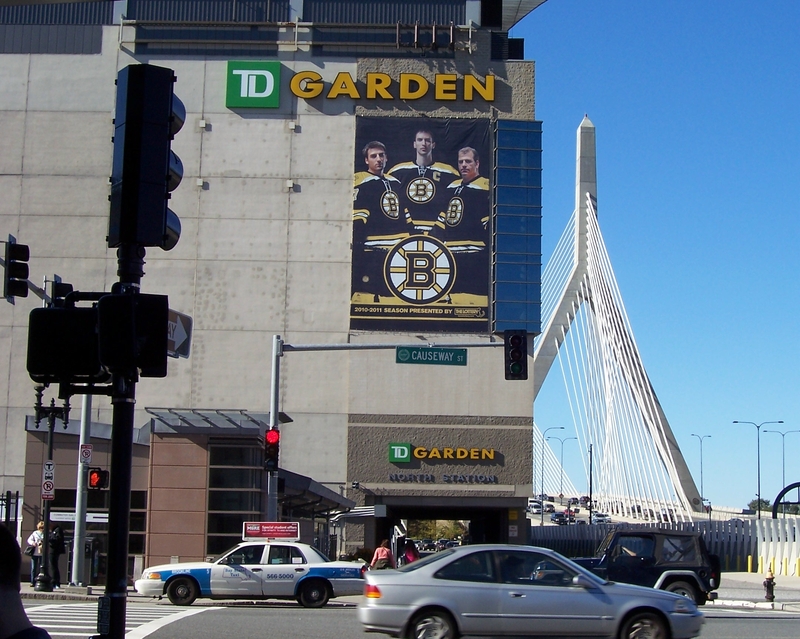 Walking in “blind faith” into the Garden, we were delightfully stunned to find the owners of the Celtics had blessed us with “promenade seating” – Alleluia! By 6:00pm, we were about 250 strong, relaxing in privileged seats that can easily hold 400! 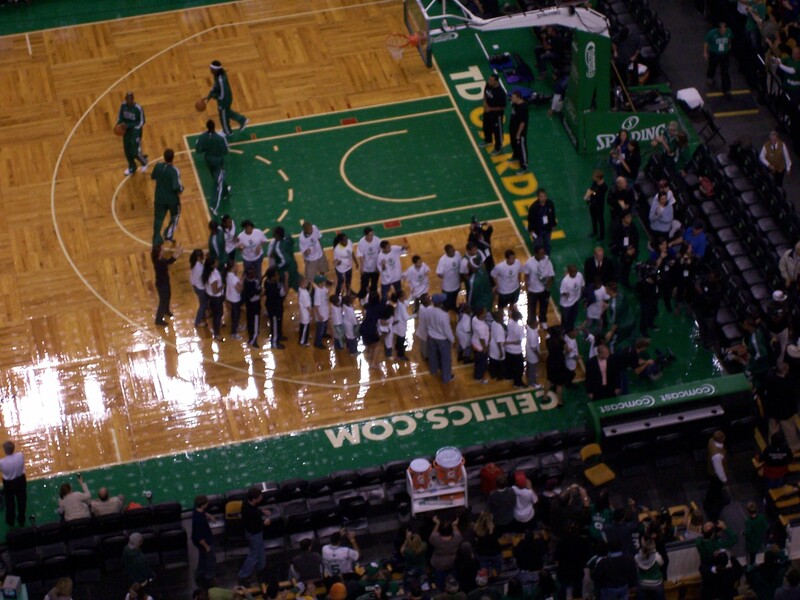 Please God, bless the Celtics for their remarkable generosity – Amen! Even though the seats and accommodations were remarkable, for us on pilgrimage, our highlight began before the National Anthem was even sung. Split into two groups, about 80 of Westfield’s “special needs’ children were allowed to enter the hallowed floor and compete in non-judgmental basketball for roughly 20 minutes – and it was awesome! Of course, the greatest cheers came from our dedicated parents who watched in joy and through tears . 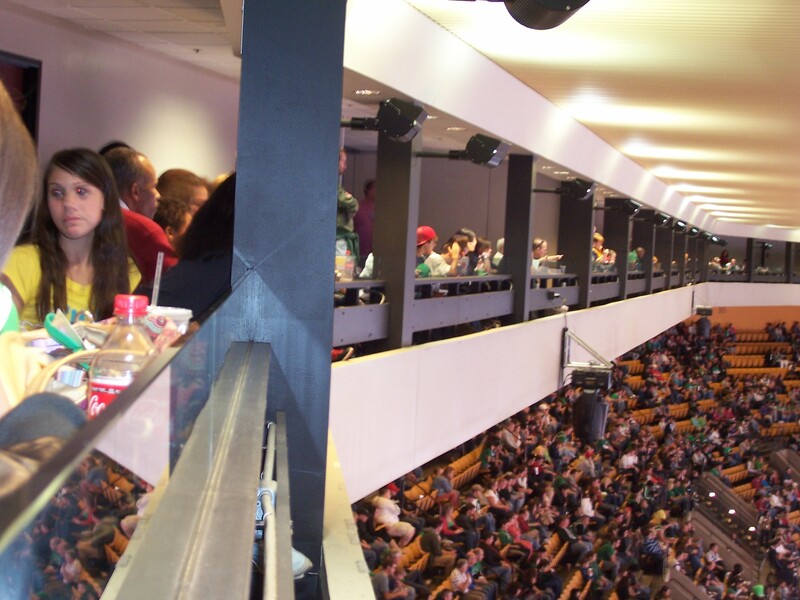 After forming the finest “fan tunnel” the Celtics have ever seen, we relaxed in our seats and watched a competitive game between two talented teams. At half time, once again, our children were on the court and loving every second! This time there were more fans in the seats and the cheering for our children was more spontaneous and intense. Praise God! 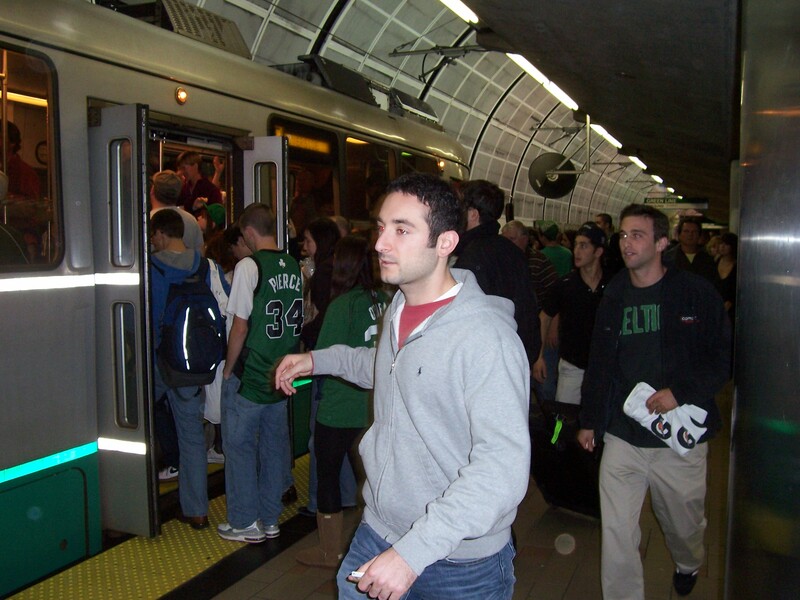 After witnessing the Celtics crush the Raptors (91 to 87), it was time to leave, re-enter the subway system and reflect upon this privileged evening of mutual love, respect and honor . For those in Western Massachusetts who are blessed with “special needs” children and siblings, we encourage you to inquire and contact the Unified Sports Program of Westfield, competently and compassionately led by Steve and Lisa Berube. Their dynamic and routinely updated website can be found at: www.unifiedsportsprogram.com/ Enjoying life, respecting God, improving self-esteem and experiencing social inclusion through mainstream sports: what a great concept! Newman Center at U. Mass. In my senior year of high school I finally got back on a bike. I was working at a camp about 2.5 miles from my house and I was carless, so I rode my sister’s black Mongoose to work everyday. Since then I’ve been trying to make any small commutes via bike – at least when the weather is nice. It gives me a chance to think about my day and to notice things I wouldn’t if I were driving. When I’m driving, I’m focused on what other cars are doing, how long until I need to be at my destination, or maybe the radio. But when I’m riding my bike, I focus on the way the wind feels on my face or on how fast the leaves seem to be changing this year. 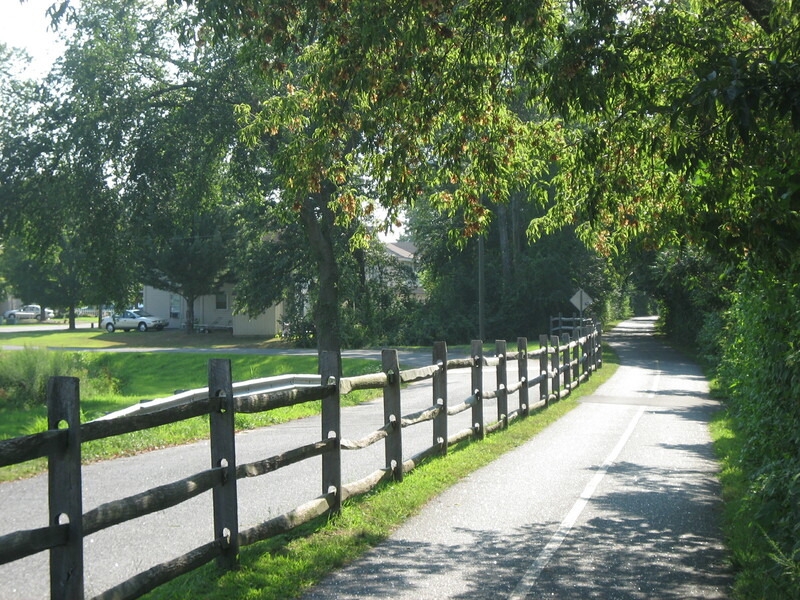 I recently started working at the Newman Center in Amherst, and with the Norwottuck Rail Trail I felt I couldn’t pass on the opportunity to try commuting to work by bicycle. So little of the United States has bicycle friendly infrastructure that I feel almost guilty not taking advantage of the parts that do provide bike lanes or trails. 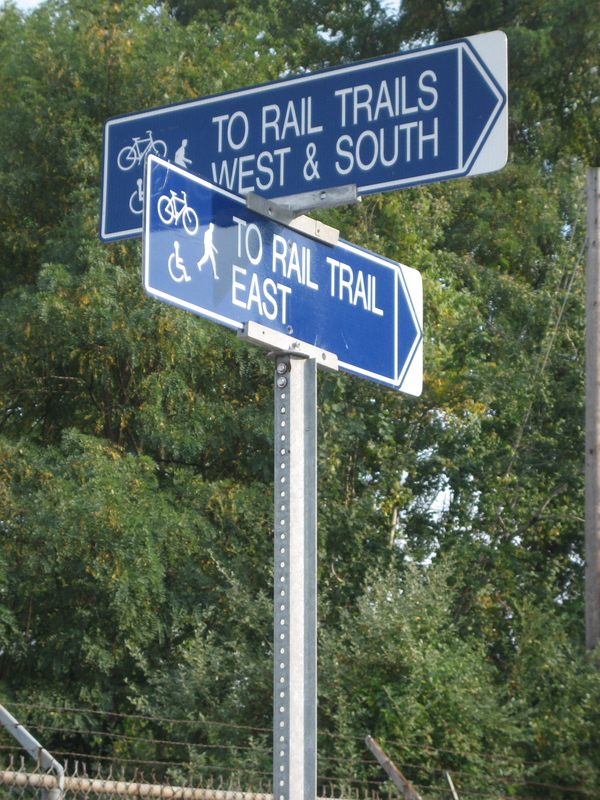 My first idea was to try to drive only partway to work, park by the bike trail, and bike the rest of the way. 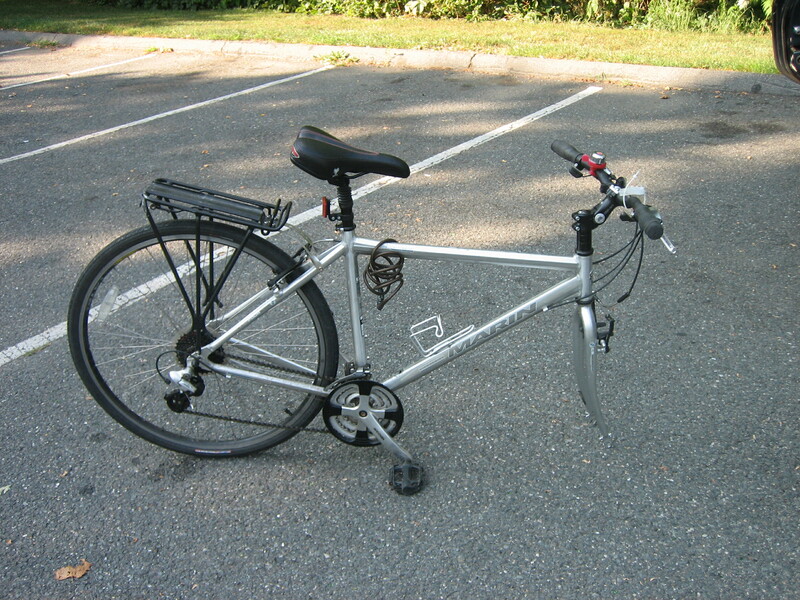 It required some bike deconstruction since my car is small and I don’t have a bike rack. 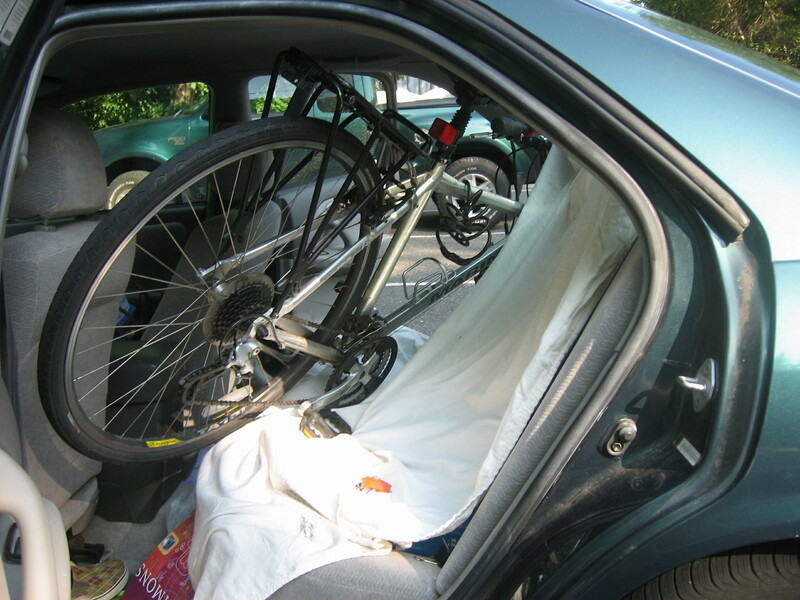 Every time I commuted I had to take the front wheel off and on again to squeeze it into the back seat. Biking was great – I felt refreshed when I got to work and the ride back to my car was an automatic de-stressor at the end of the day. But the hassle of getting my bicycle in and out of the car (and rainy forecasts) had me driving the whole way again for the next few weeks. But then this past Friday the forecast was for sunshine all day. I decided to do it: bike the entire way to work. That’s 18 miles one way. 36 miles total for the day. 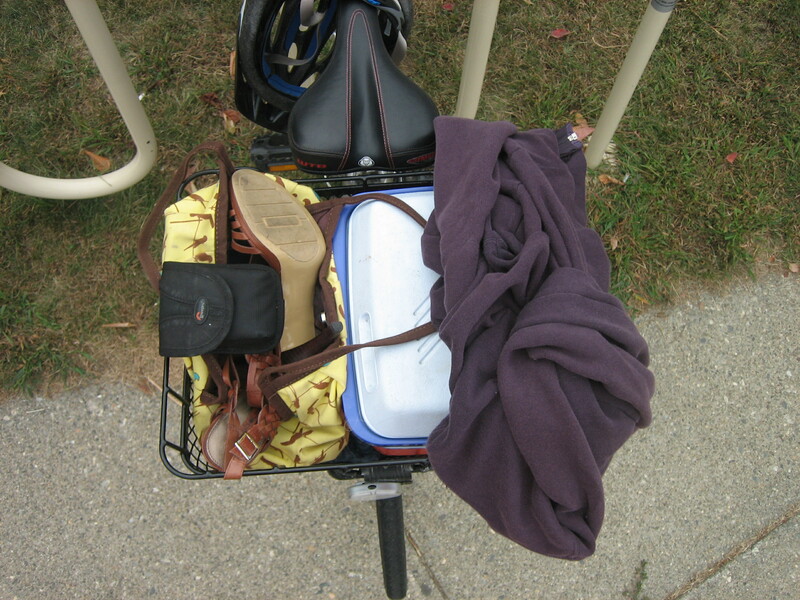 I got up extra early to give myself enough time to get to work, packed up my basket (lunch box, purse, camera, nice shoes, and sweatshirt), and away I went. It was hard. I’m not going to lie and say it was easy, because it wasn’t. My legs were tired, and I got lost (tip: if you’re trying to go east, don’t follow the signs that say “west”), adding an extra 3 miles to my ride there. But I loved every minute of it. 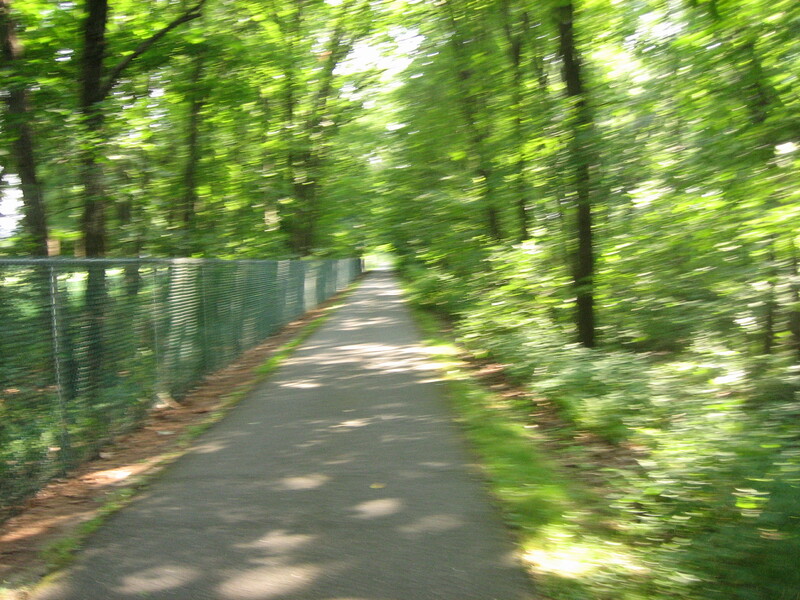 Riding down route 5, cycling beneath the trees arching over the rail trail, saying good morning to other early-morning cyclists – it was all wonderful. The way home was even harder since the last 6 miles or so were uphill. I had to give my legs a pep talk with about 2.5 miles to go. I told them, “I know this is hard, but you’re amazing. You’ve gotten me this far and you can get me home.” And you know what? They did. And it felt amazing. I plan to do it again as soon as this rain disappears. This probably isn’t feasible for most people. And that’s fine. I understand that people have kids or other commitments and can’t afford to spend 3 hours on their commute. But instead of thinking about what you can’t do, think about what you can do. Can you drive partway and bike the rest? 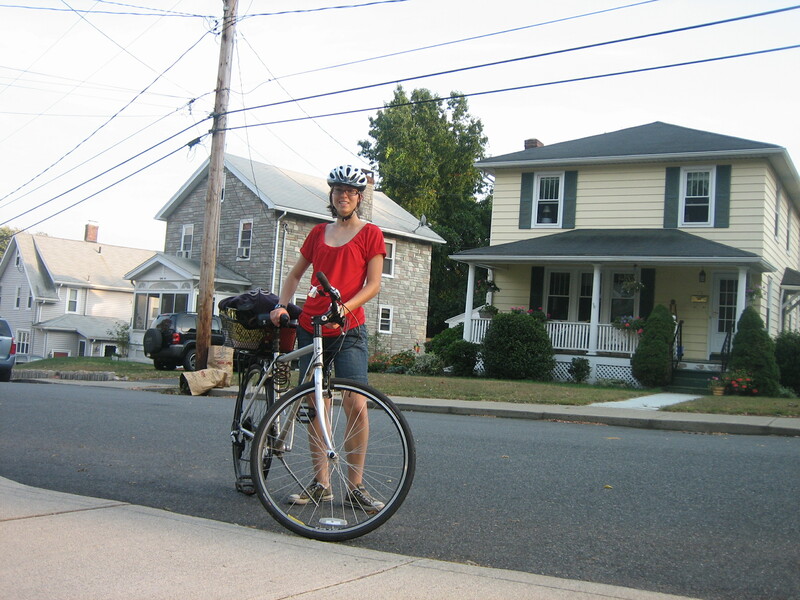 Can you use your bike to do some errands, like going to the bank or out for coffee? 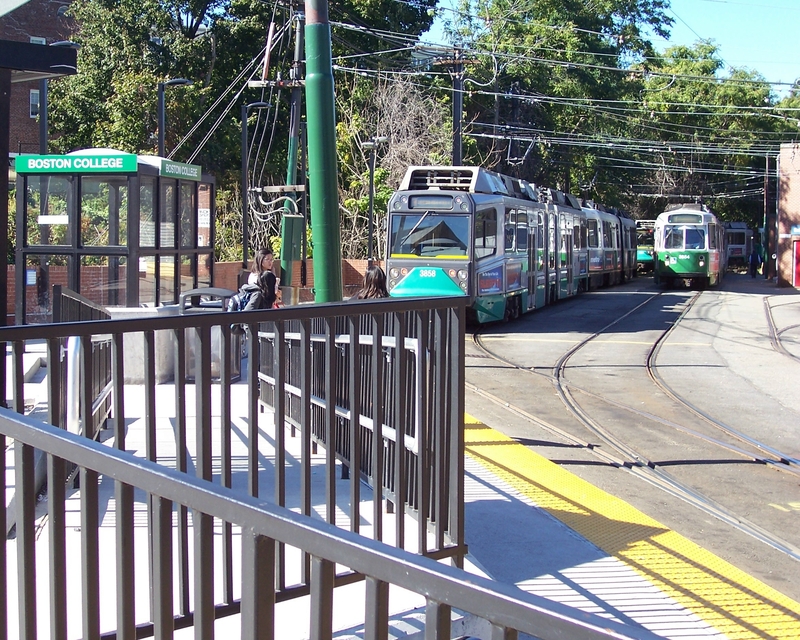 Even if you don’t have a bike, could you take public transportation more? Do what works for you. The same is true in giving to others. 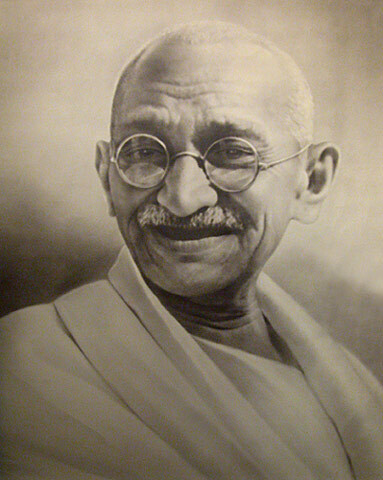 What one person can give of themselves may simply not be possible for you. If you can’t give $50 to a charity, can you give $5 or even $1? Can you offer your time instead of your money? Think about what you can do in all aspects of life, not what you can’t. You’ll be amazing to find all the things that you’re capable of. 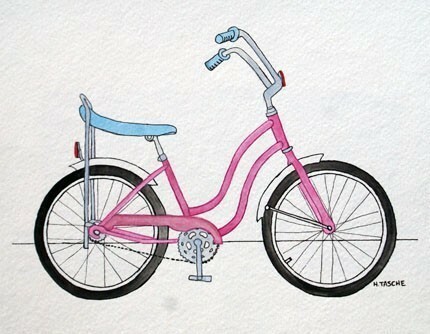 I want to see a more bike-friendly, less car-dependant world, so I ride.